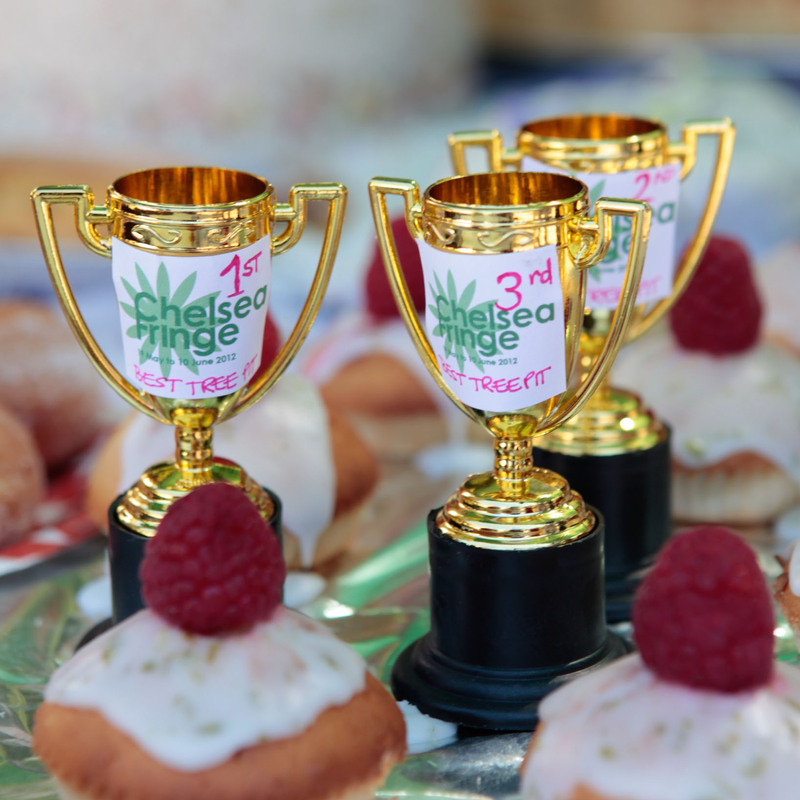 This year, the Blackstock Triangle Gardeners are holding a Mega Cake Sunday at 52-66 Ambler Road, N4 2QR as part of the Chelsea Fringe (a quirky, fun, horticultural alternative to the Chelsea Flower Show with loads of events & happenings to go to, most for free, in London & beyond). There’ll be oodles of tea and cakes and bonhomie. 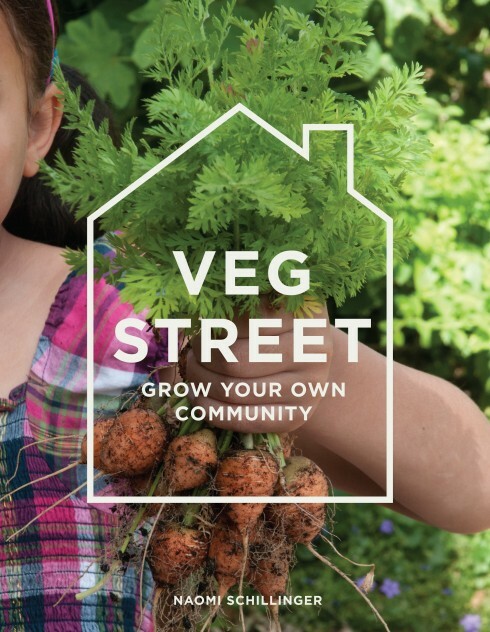 Come and talk to the Blackstock Triangle neighbours about community gardening, how your seedlings grow and anything else that’s on your mind. Between 3 and 4pm, we’ll also be holding our very own Chelsea Fringe Dog Show. There are 6 categories to enter, so just click on the categories below to enter your dog. We think it may be a busy event, so book a place now to avoid any doggie disappointment. They’ll be doggie treats and horticultural goodies for all winners! 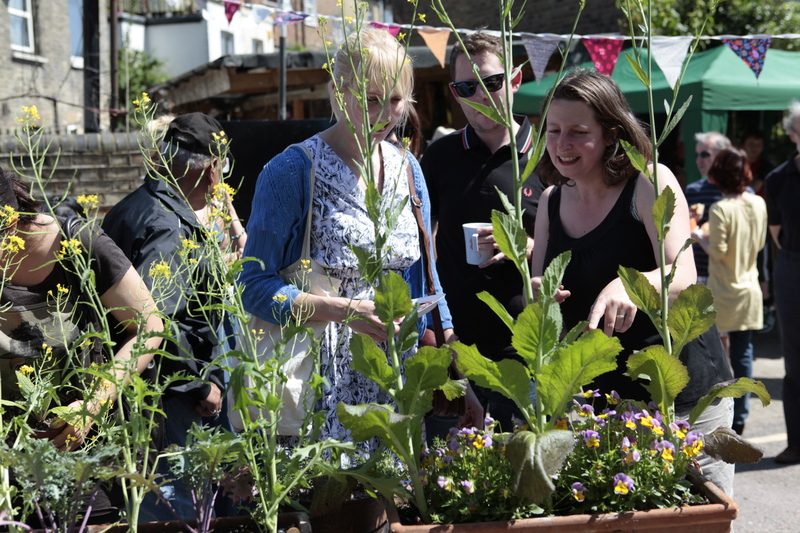 We’re also delighted to be part of the London launch of the ‘Candide’ gardening App, and to celebrate all things community, they’ll be giving away free seeds and plants on the day. 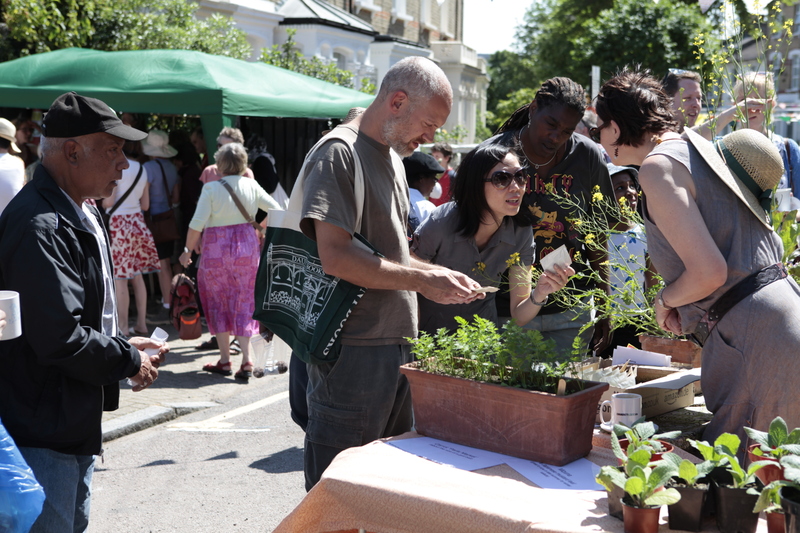 So come and have a horticultural chat and take plants away to green up a neighbourhood near you! The Cinnamon Trust will be joining us too. They’re a national charity who help owners look after their pets when they can no longer manage on their own, by helping to walk dogs every day, fostering pets when owners need hospital care or fetching pet food. Glad to have them with us for the afternoon. 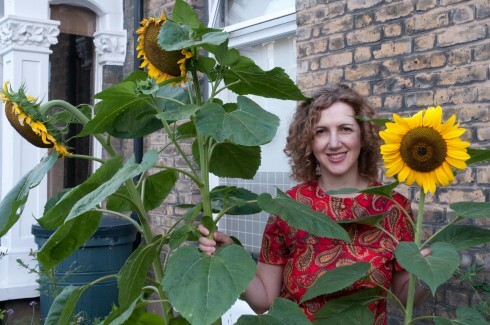 In 2009, Islington Council’s wildflower seed give-away for tree pits (the bases around street trees) inspired two neighbours, Naomi Schillinger (that’s me above) and Nicolette Jones, to start up a community growing project in North London. 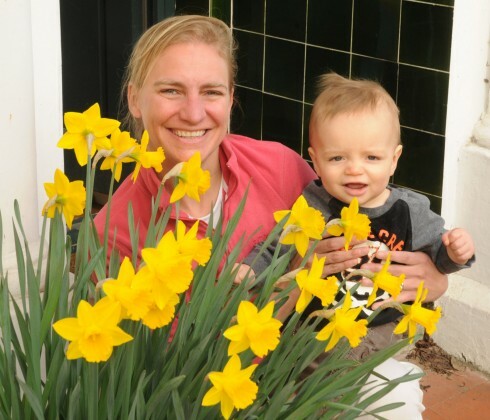 Since then, over a hundred households in our neighbourhood have joined in pimping our pavements and growing vegetables and flowers in front gardens and window boxes. 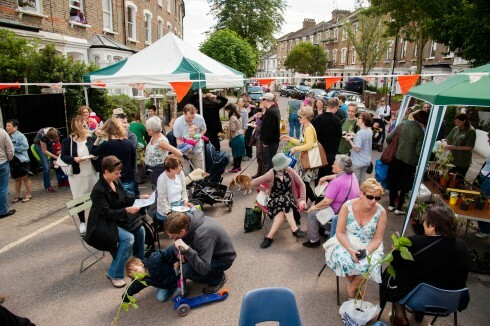 Not only have our gardening activities greened up our streets, but by spending time in front gardens and organising ‘Cake Sunday’ get-togethers, neighbours have got to know one another, really building a great sense of community and belonging. 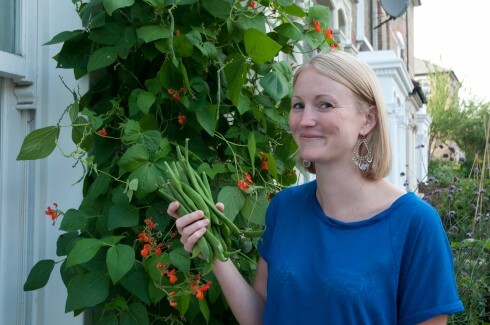 Nothing can beat the joy of growing your own veg and it’s fantastic to be able to pop out into the front garden to pick dinner from your doorstep (with zero food miles and no supermarket sprays!). 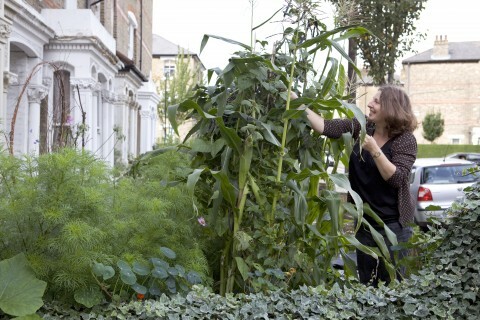 I know in our borough (and many others in inner London), allotment lists have been closed for some while now, so I think it’s time to think creatively about growing spaces in urban neighbourhoods. 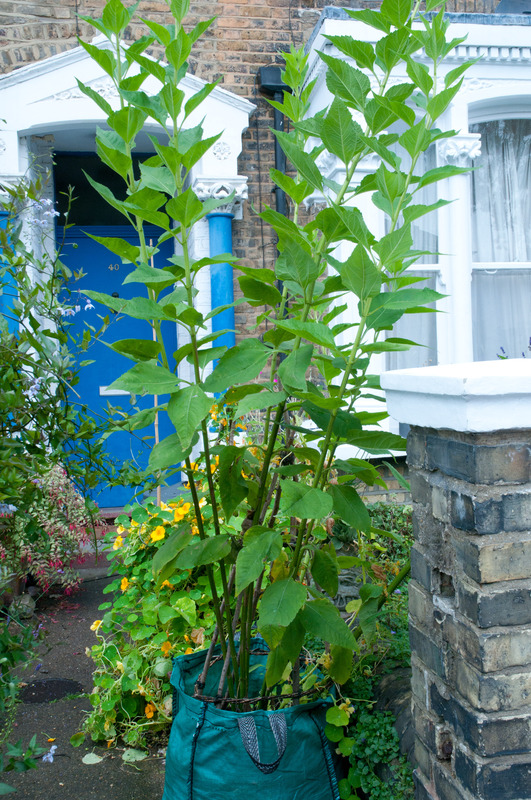 Our front gardens may be small, but it’s amazing how much you can grow in those few precious square metres. Out in the streets, our tree pits looked amazing last summer. 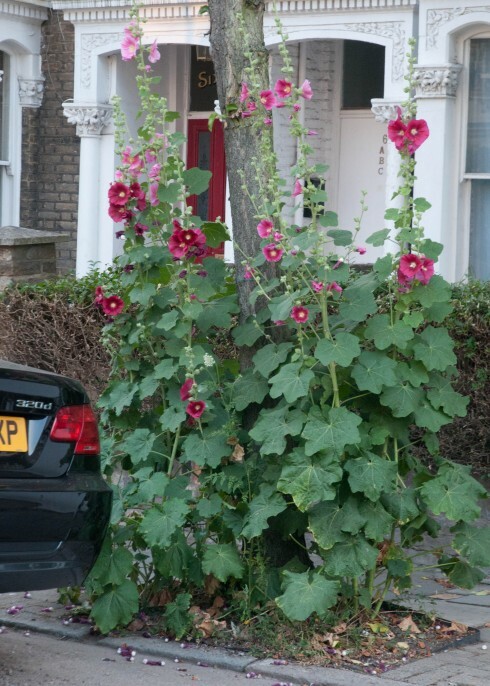 Hollyhocks are a big success in this somewhat tricky of planting environments and we have plans afoot to plant up more of our tree pits in 2019 to act as Nectar Bars to attract more pollinators into our streets. 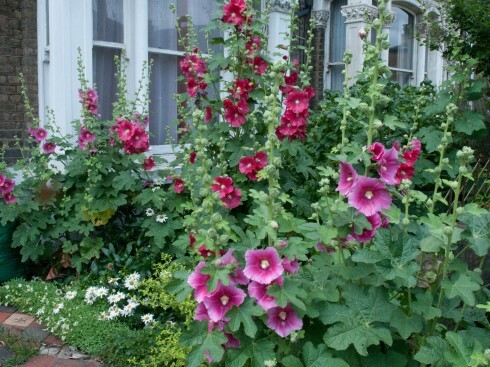 We’ll be sowing more Hollyhock seeds so we have plenty of small plants to give away, and we’re also thinking about other drought tolerant, tough plants such as Lavender, Salvias and Erigeron to experiment with. Verbena bonariensis, Teasels, Fennel and Sunflowers (Helianthus) will be planted to add height to the tree pits and Crocosmias, Asters and Japanese anemones should provide pollen for late summer alongside Skimmias, Sarcococcas and Abelias for Autumn and Winter interest. 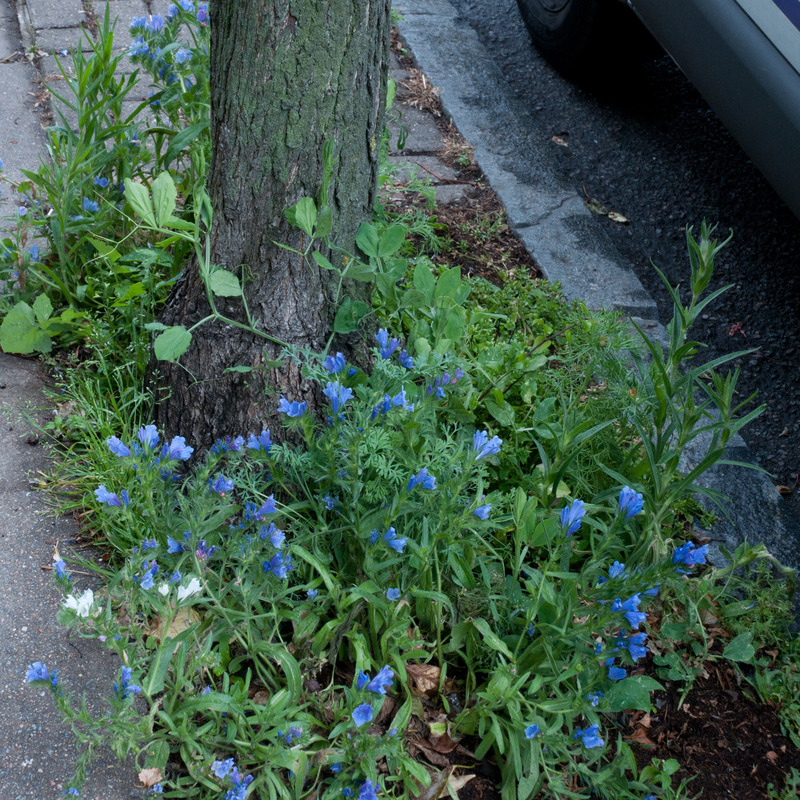 Can’t wait to see how the streets bloom this year! Carry on reading for more background information and to see how our project has developed over the last ten years. 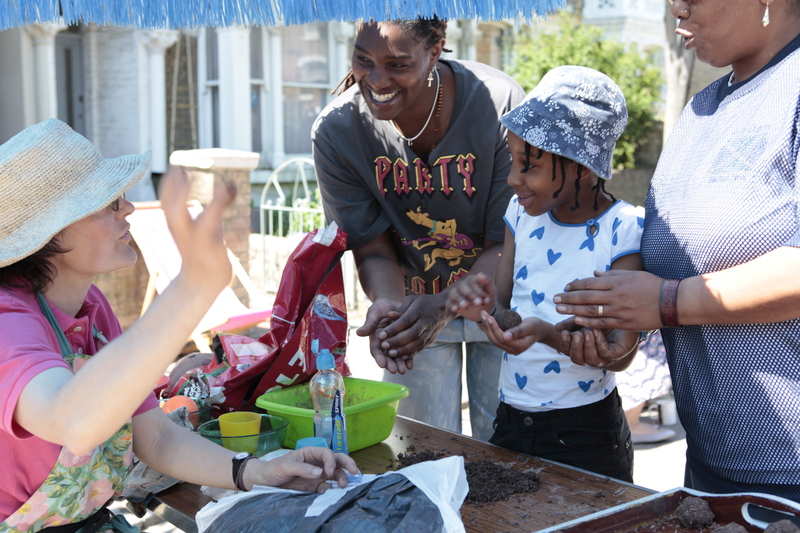 Having shared packs of seeds with nearby neighbours, wildflowers flourished in the tree pits and residents started to get to know one another by swapping plants, helping each other with gardening jobs and just stopping in the street to chat about how the area was greening up. 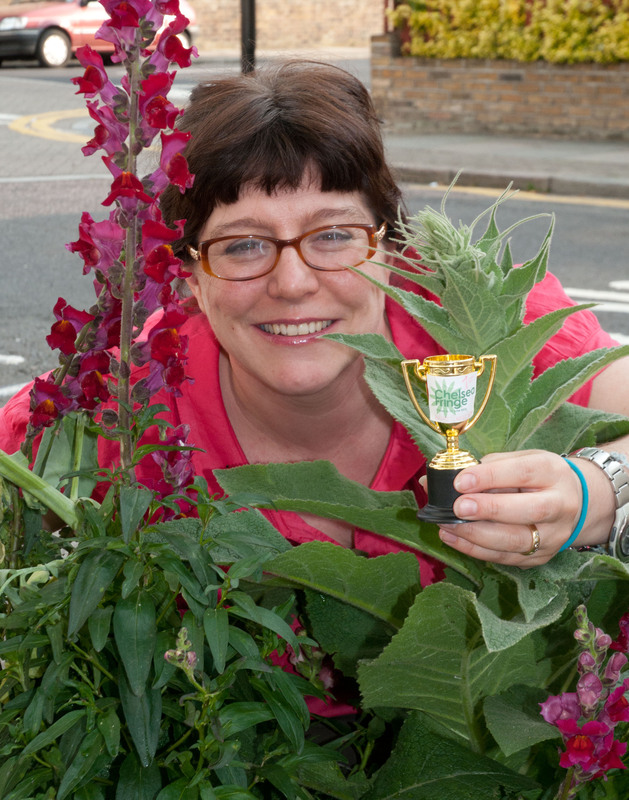 We entered two adjoining streets into the 2009 ‘Islington in Bloom’ competition and we were delighted to win 5 awards between us, including a specially created community award. Great joy!! 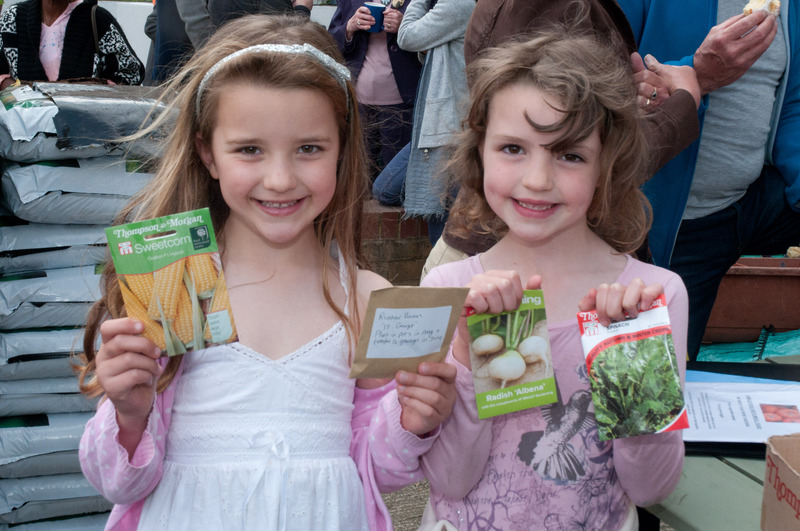 By 2010 the council had stopped giving away seeds, but the enthusiasm for growing was now unstoppable. 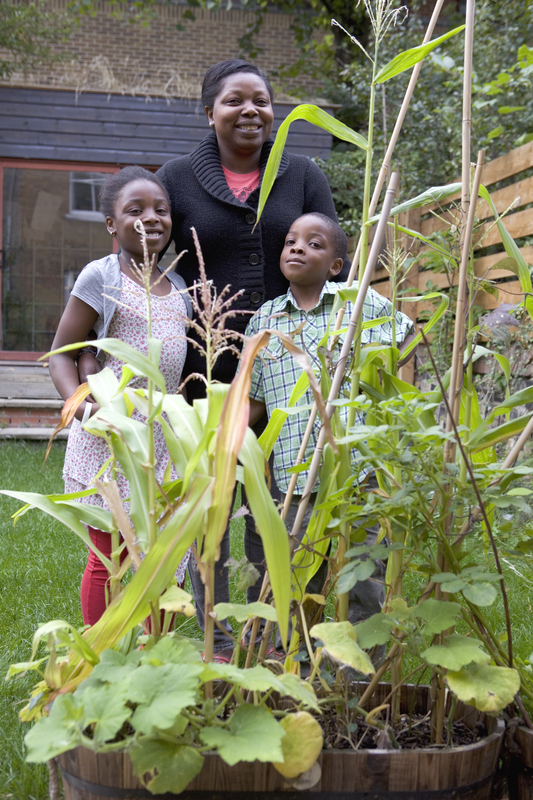 By chance, we met a gardener who was looking for people to join in his ‘3 Sisters’ veg growing experiment, and instantly the idea growing vegetables in front gardens was born. 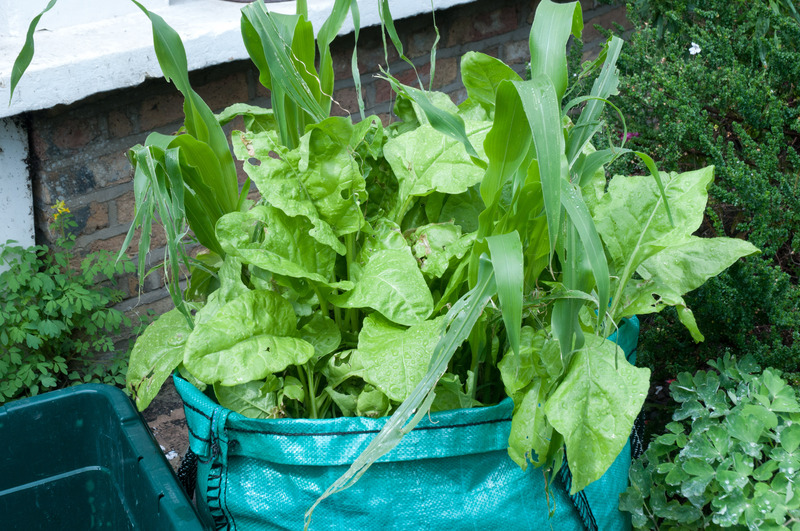 The ‘3 sisters project’ was to grow corn, runner beans and squashes all in one grow-bag, hopefully creating a symbiotic growing relationship between the veg. Would this combination of plants work in a bag in UK growing conditions? 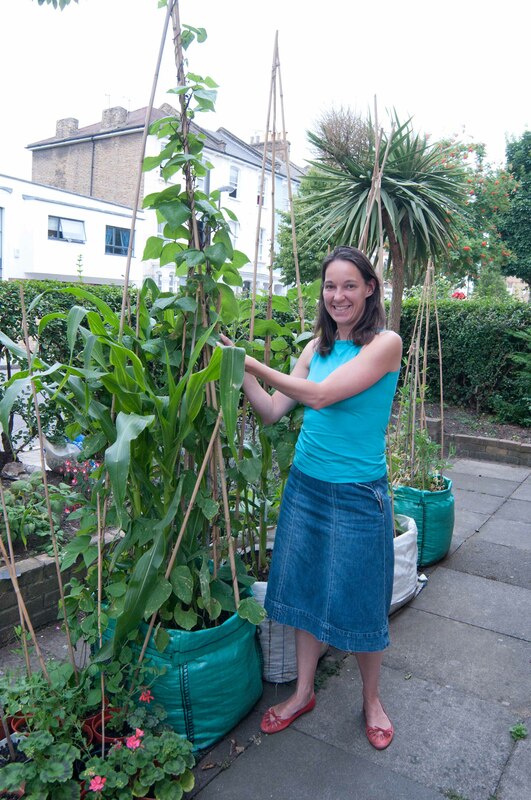 By knocking on doors, emailing neighbours and leafleting the streets, in our first year, 50 households joined up to grow vegetables in grow-bags in their front gardens. 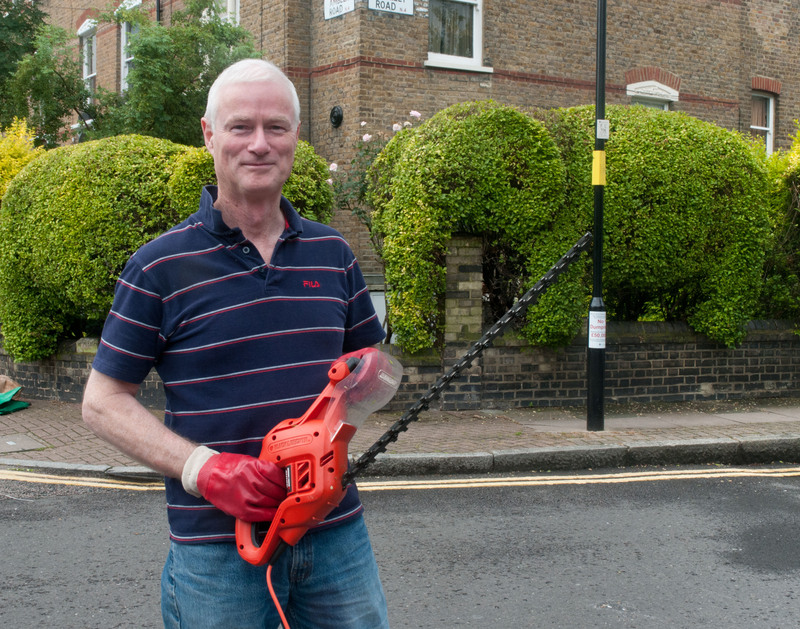 Fortunately, funding was available from ‘Capital Growth’ and Islington Gardeners. 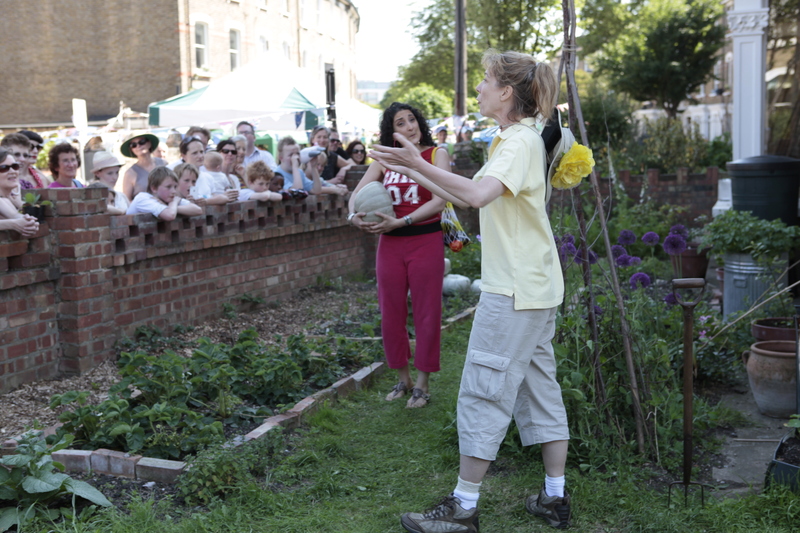 In order to distribute the packets of seeds, we came up with the idea of holding a front garden get-together which we called a ‘Cake Sunday’. Neighbours made absolutely delicious home-made cakes which were served up with tea and coffee and participants could drop by to pick up seeds and meet the neighbours. 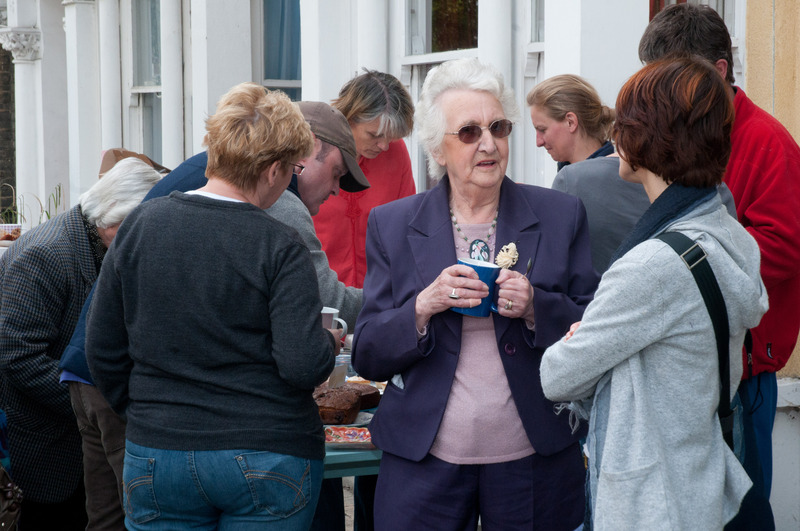 The first ‘Cake Sunday’ proved to be a run-away success and we started to realise that there was a great appetite within our community to get to know your neighbours. It was a very jolly gathering, where some neighbours met each other for the first time and everyone got to know more about the about the growing project. and neighbours were then all set for growing their vegetables. 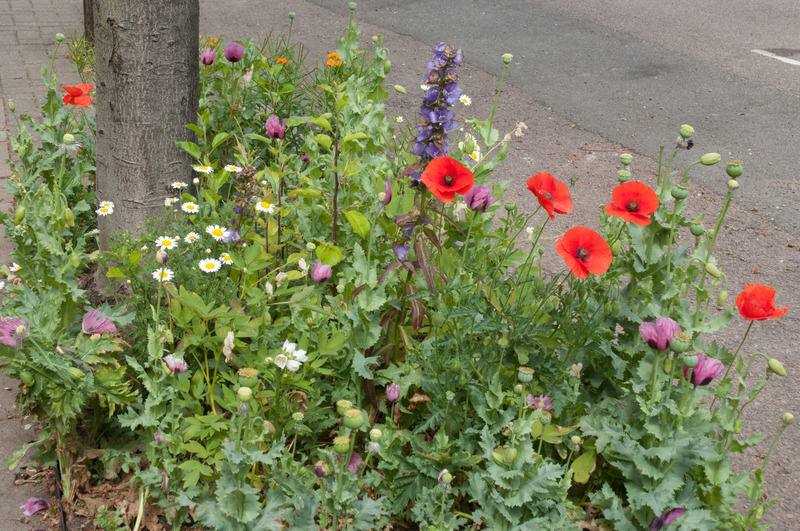 Islington council were so impressed with our project that they asked us to be a part of their entry into both ‘London in Bloom’ and ‘Britain in Bloom’ and helped us to green-up our area by edging 15 tree pits with metal Everedge edging, enabling us to plant up perennials as well as annual seeds. They also generously donated some money to buy plants for the tree pits. 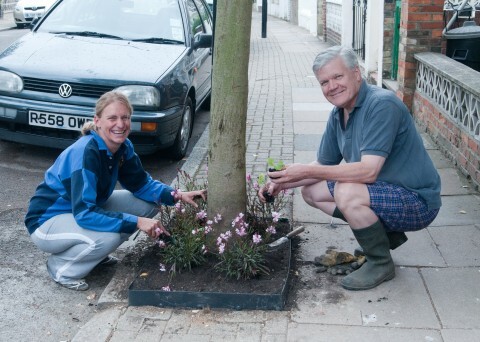 Many residents also bought plants and enthusiastically took ownership of a tree pits. 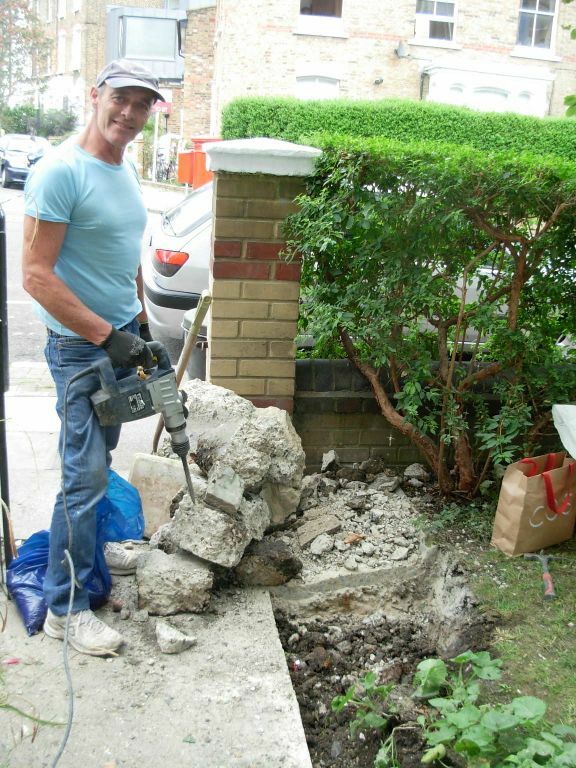 As well as greening up tree pits, we were also very lucky in receiving grants to remove concrete from 10 front gardens. 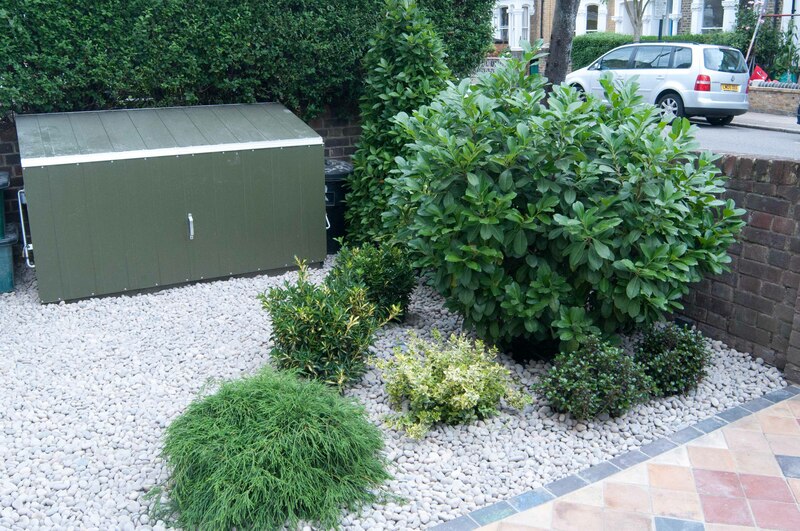 This dramatically improved the look of both the individual garden and the surrounding gardens and also helped to increase drainage in the area too. and here’s the ‘after’ pic. 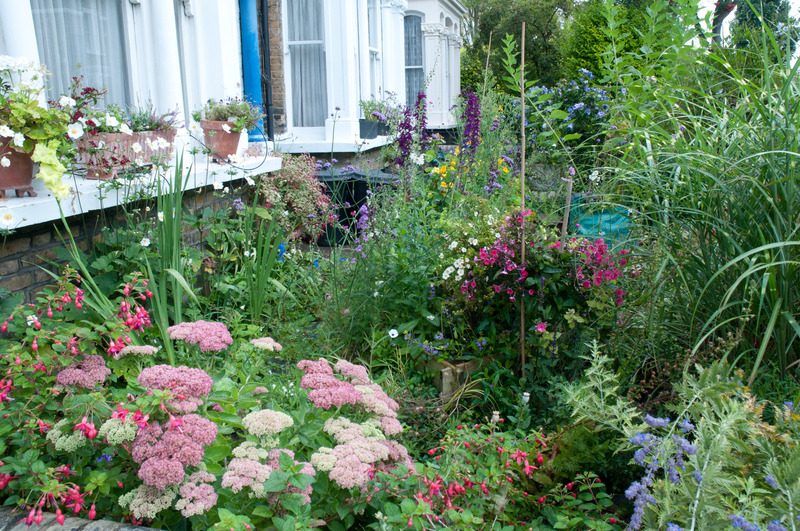 The garden is transformed from dismal to delightful, with the added benefit of increasing drainage, plants helping to reduce pollution from passing traffic and making the garden much more interesting and cheering for all who pass by. As the summer progressed, so the crops grew, and by the end of August, the grow-bags were looking very impressive. 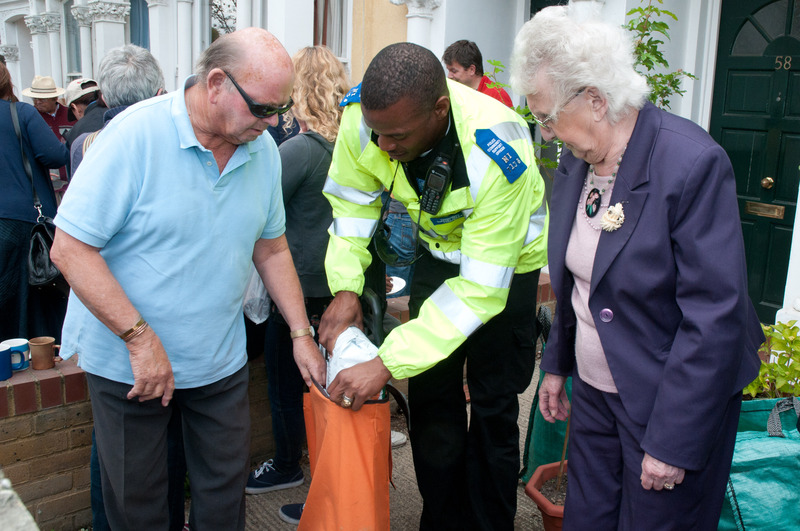 to which over 50 residents attended, plus our local police force! It’s now the end of summer in 2010. The growing project has been hugely successful in bringing our community together, and in 2011 we hope to increase participating households from 50 to 100. 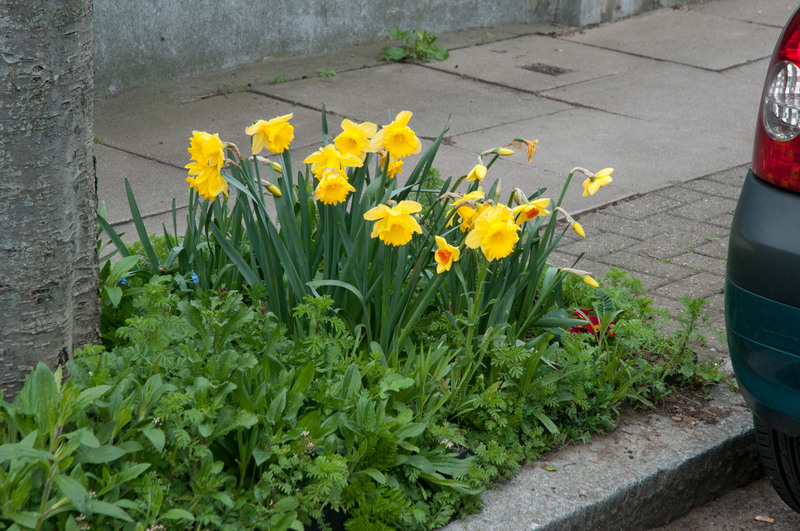 Funding is tight this year due to cuts, but we hope to raise enough money to carry on, encouraging neighbours to green-up our area, to grow vegetables and to continue getting to know one another. Since starting our projects, we’ve formed a constituted group called the Blackstock Triangle Gardeners to reflect the area that we live in. Still waiting to hear back from funders to see if we can get funding for this year. 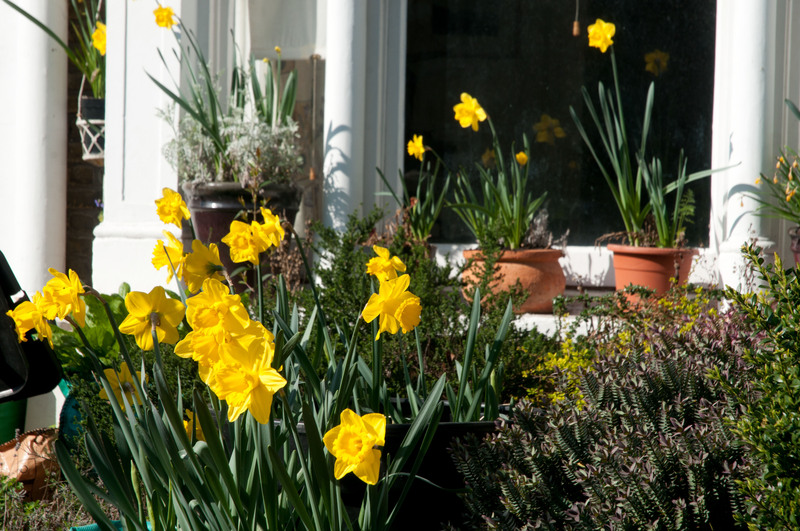 In the meantime, the streets are looking glorious with our daffodils in full bloom. Hurrah! We have just received a letter letting us know that we have funding from the Islington Community Chest to continue our project this year. All systems go! Lots to do. 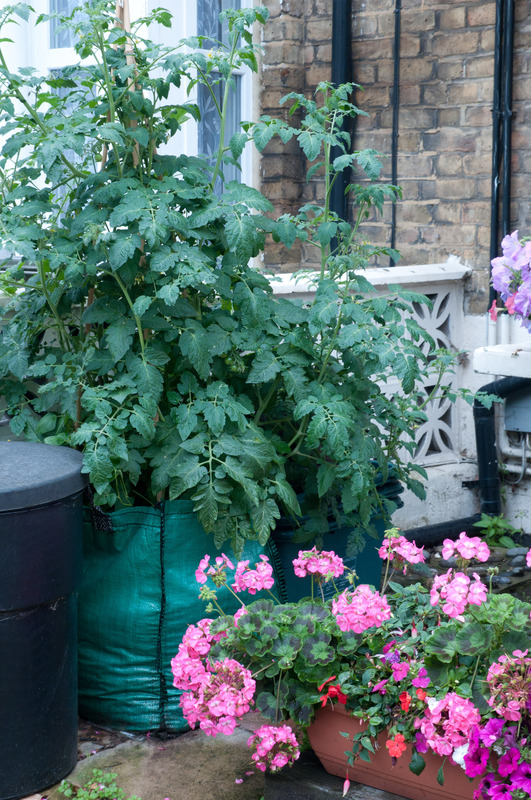 We need to organise free compost delivery , order grow bags, update the list of participating neighbours and add new residents to this (by knocking on doors! 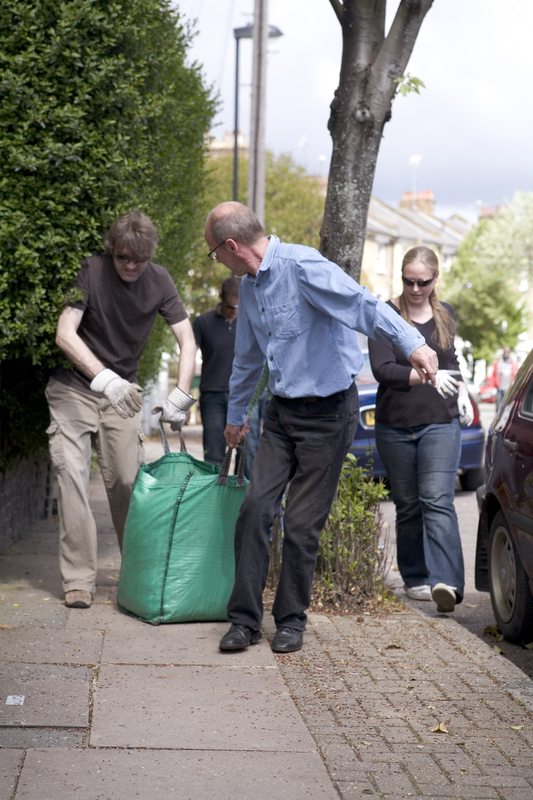 ), buy veg seeds for the bags and wildflower seeds for tree pits and organise van hire and volunteers to distribute the bags of compost. 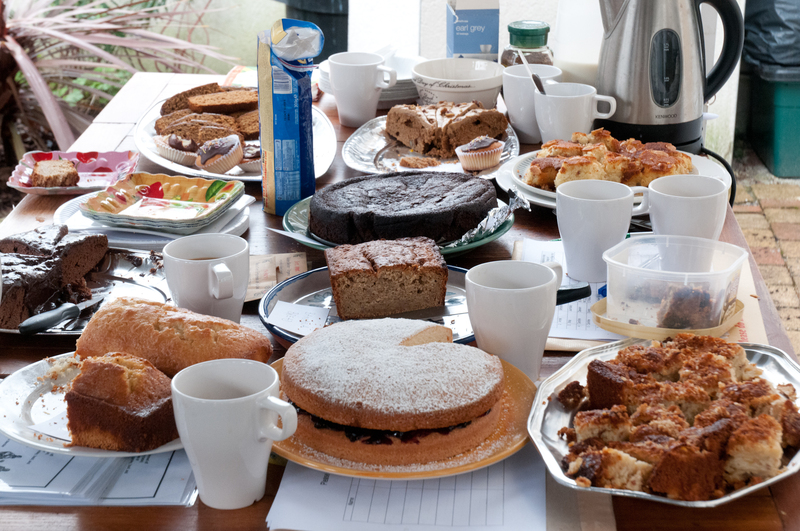 Not forgetting another ‘Cake Saturday’ event when neighbours get gather together, over tea and cake, to discuss this year’s growing project and indeed anything else. Think I need to take a deep breath! 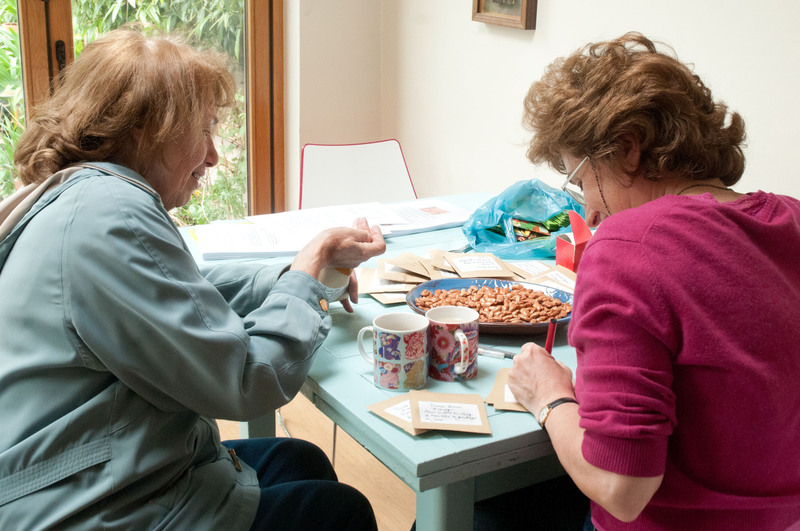 We’re counting out and packing up our runner bean seeds (above) as our next event is ‘Cake Sunday’ on Sunday 15th May where we are giving away free seeds and plants and catching up over tea and home-made cakes. Another spring and another ‘Cake Sunday’. 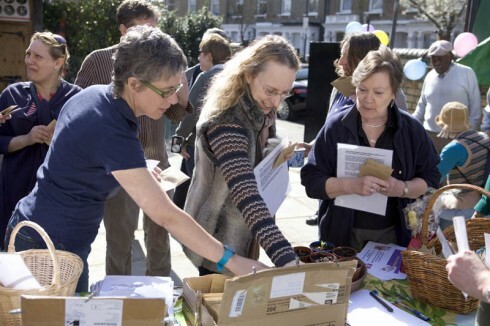 Our knocking on doors and emailing neighbours has paid off and many residents got together last weekend in one of our front gardens to pick up their free seeds and to discuss the veg growing scheme for this year over tea and cakes. 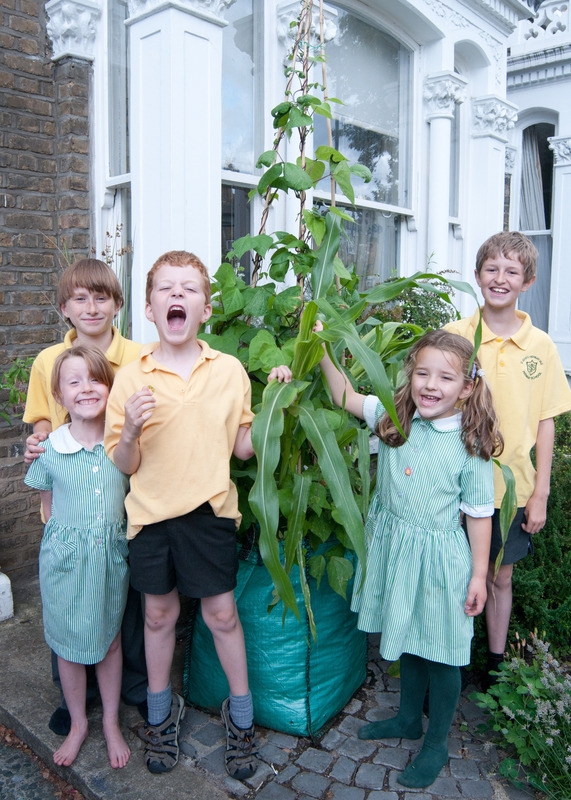 Last year we experimented with growing corn, squash and runner beans in growbags in front gardens, with the help of a Capital Growth grant. 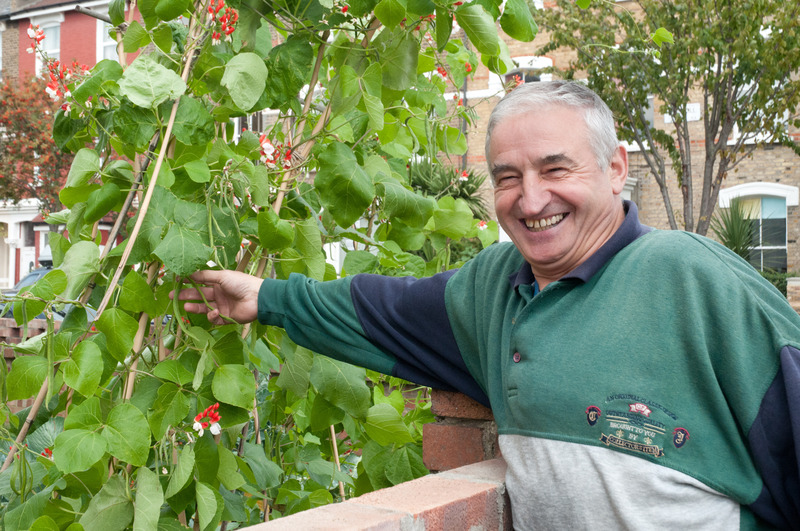 Following its success, especially with the runner beans, this year we’re giving away free runner bean, spinach and radish seeds (thanks to funding received from Islington Council’s Community Chest and Islington Gardeners) and as before, large growbags, full of rich compost, will be delivered to residents’ front gardens in a couple of weeks. 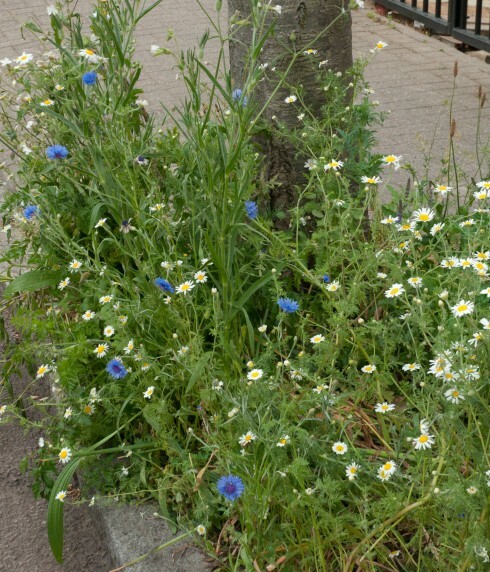 We also have a specially concocted mix of annual and perennial wildflower seeds to give away, which we sourced from Landlife Wildflowers, to sow at the base of our street trees. 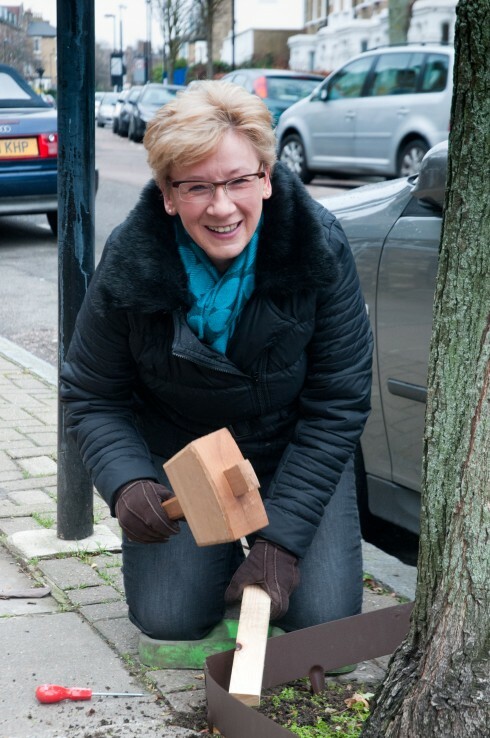 These tree pits really enliven the area and do encourage dog owners to be more responsible about where their dogs do their business! and signed up the local police station at the end of our street to join the veg growing scheme. 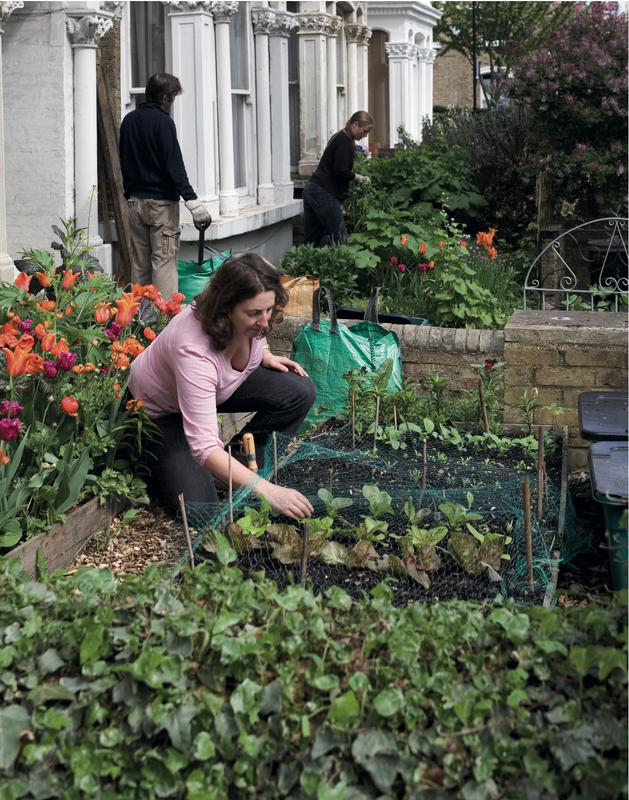 This year we’re managed to double the number of participating households from 50 to 100 as more neighbours are keen to join in growing vegetables and above all, want to get to know other residents in their neighbourhood. 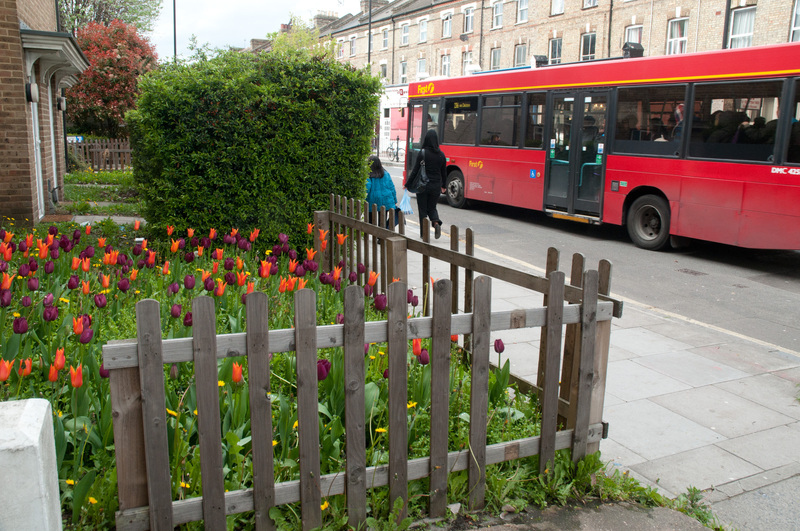 As numbers of participating households increase, the Blackstock Triangle area in Finsbury Park is becoming an even more friendly place to live! Community veg growing project in Gardening Which? 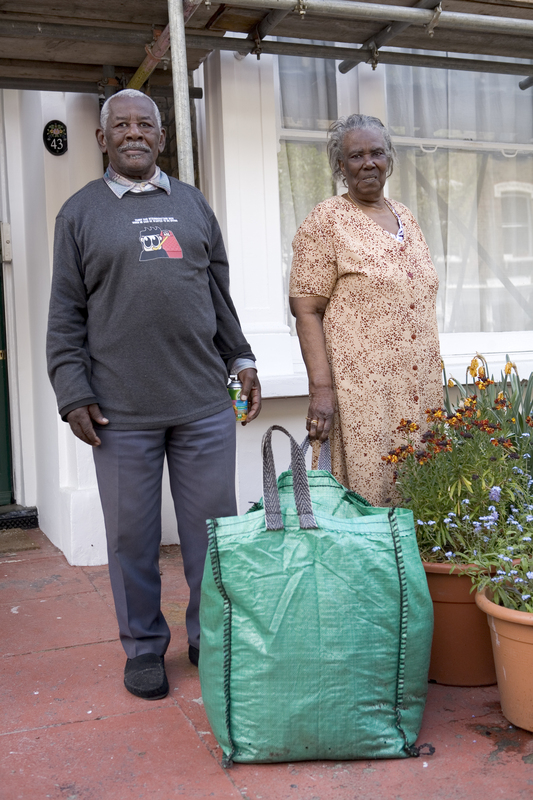 Yesterday,we spent the whole day distributing green growbags (as in pic above) to our neighbours’ front gardens for this year’s Community veg growing project. 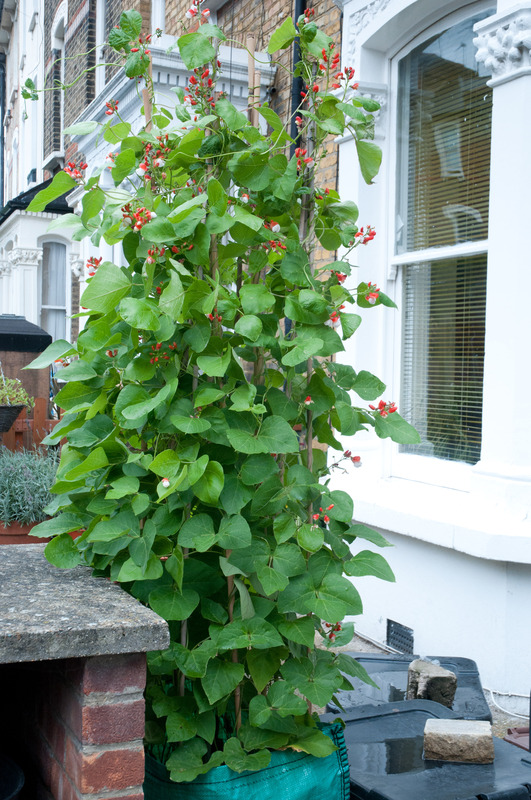 Pic above is also part of a 4 page article in Gardening Which? this month. Unfortunately I can’t include a link to our article, as it’s only accessible to members, so below I’ve copied and pasted the rest of the article. That’s me above (in pink) in my front garden last May. Most photos were taken last year during the growbags give-away day in May and at the end of the growing season in August. This year, we’ve doubled the number of participating households from 50 to 100! 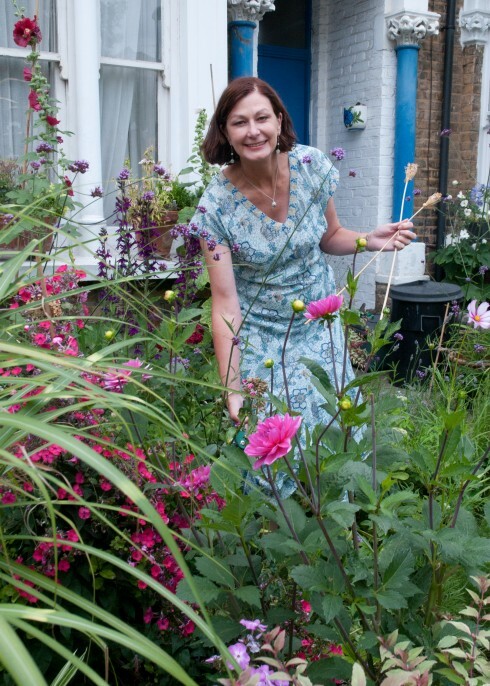 READERS of a leading consumer magazine have praised an award-winning project that is bringing people together by transforming their front gardens. Writing in the current edition of Which? 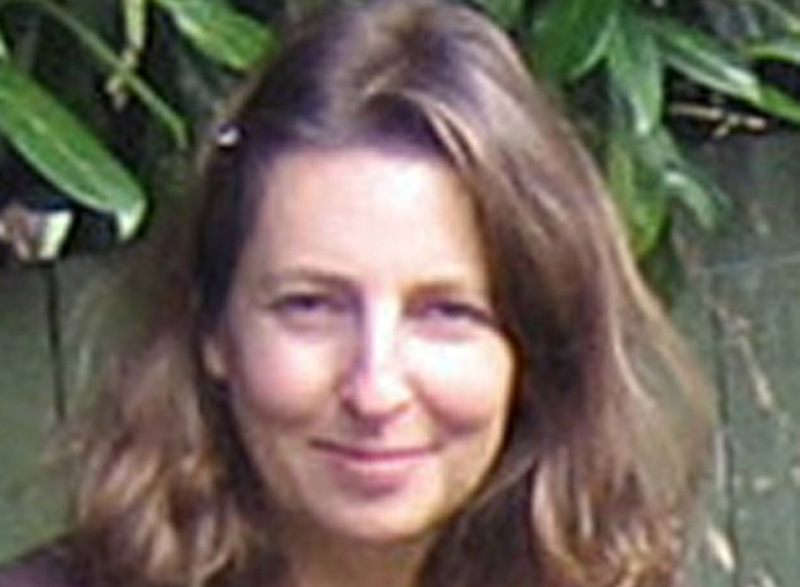 Gardening, one correspondent, who said she had been the victim of a mugging, described how reading about the Blackstock Triangle Gardeners scheme had “restored my faith in human nature”. 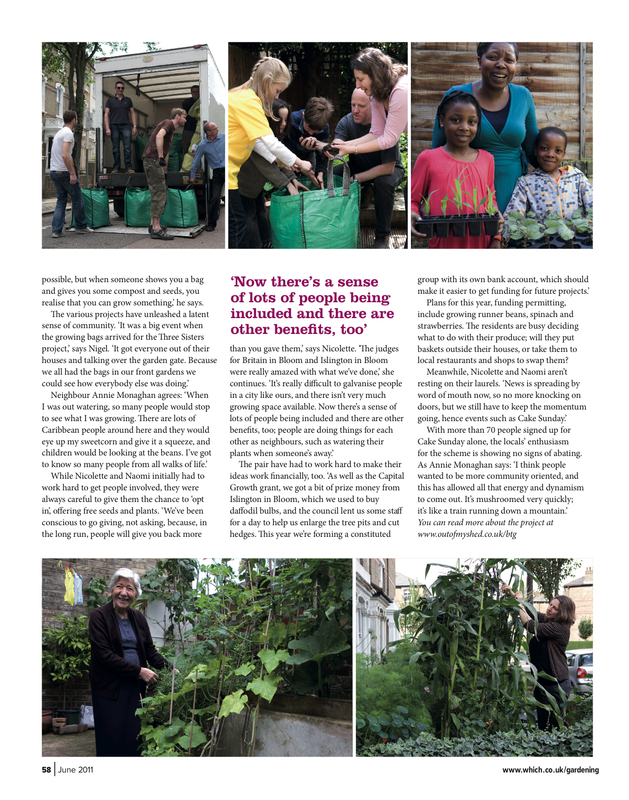 Last month the magazine devoted a four-page colour photo spread to the green-fingered Finsbury Park residents in an area around Ambler, Plimsoll, Prah, St Thomas’s and Monsell roads who are part of the scheme. 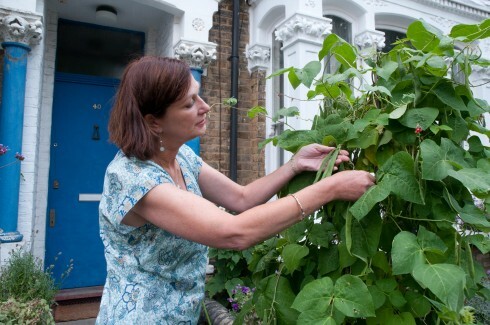 Along with flowers and herbs, the residents, who all live within hundreds of yards of bustling Finsbury Park station, come together to produce 12ft runner beans, tomatoes, sweet corn and squash – all cultivated in large grow-bags in front gardens. Since a report on the scheme in the Tribune last year numbers of households taking part have doubled from 50 to 100. Residents Naomi Schillinger and Nicolette Jones are the driving force behind the project. Naomi is a professional gardener and can give advice while Nicolette, who runs a Neighbourhood News email, helps spread the word. Naomi said she was proud that their efforts had won recognition in such a prestigious national magazine. “The feedback from readers has been fantastic,” she added. “We often receive enquiries about the Triangle and have gone and given talks in various parts of the country. Even children such as Shola, eight, and his sister Sayo, nine, who attend St John’s primary school in Highbury Vale, have got involved. 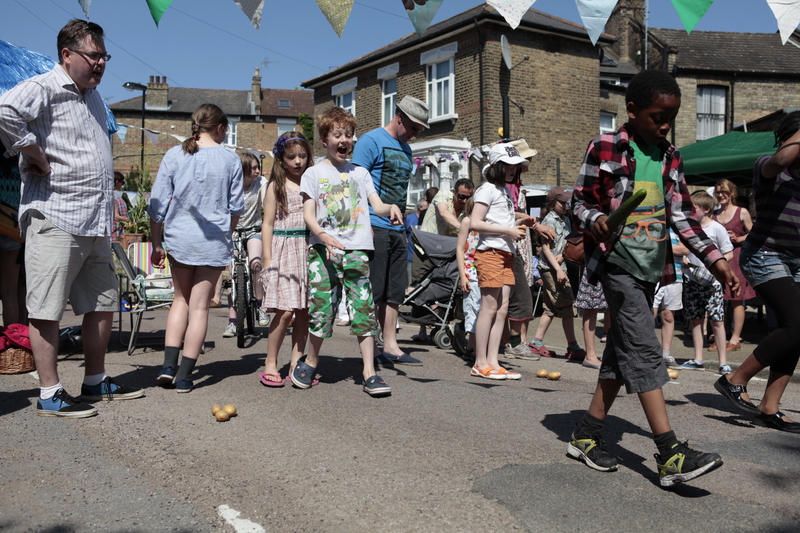 • The Plimsoll Road street party is being held on Saturday, July 16 from 1pm to 6pm. 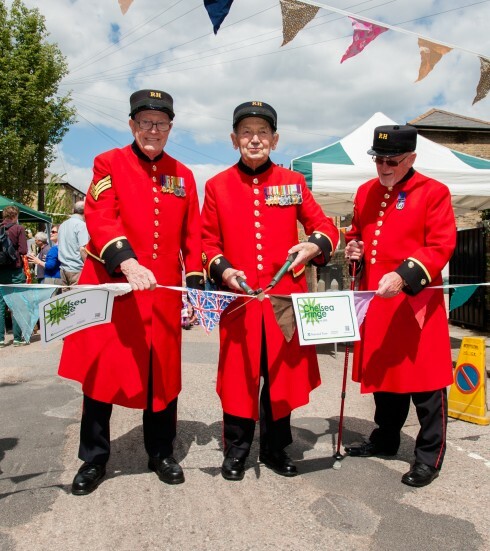 Residents can enjoy live music, children’s games, a barbecue and a chance to meet the neighbours. 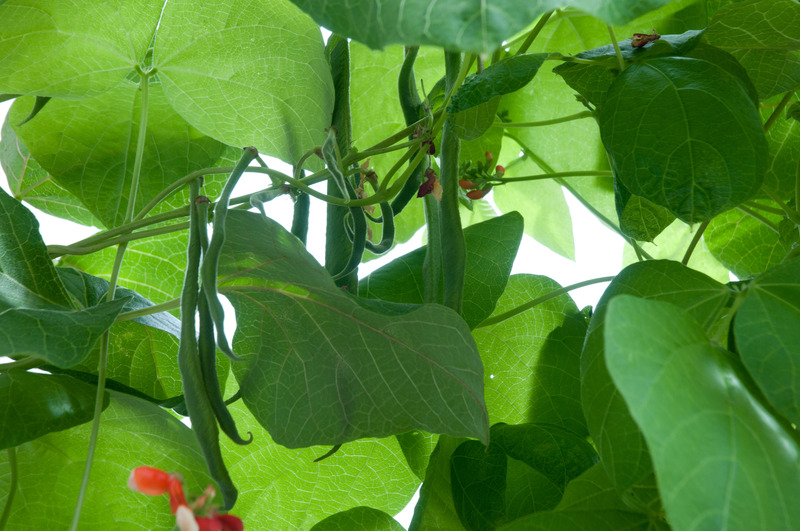 Plenty of rain and sunshine has really helped to produce a fantastic crop of runner beans this year. And our tree pits, and front gardens look amazing too! Soon, it will be time to have another ‘Cake Sunday’, where lots of neighbours catch up with each other over tea and cake in a front garden, and we have loads of free bulbs to give away for next spring too. 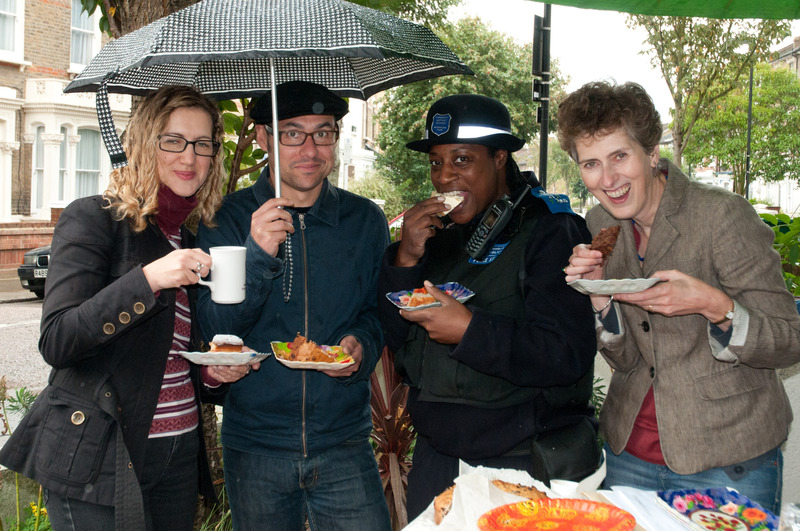 It’s great to see our local urban community brought closer together through gardening and cake! 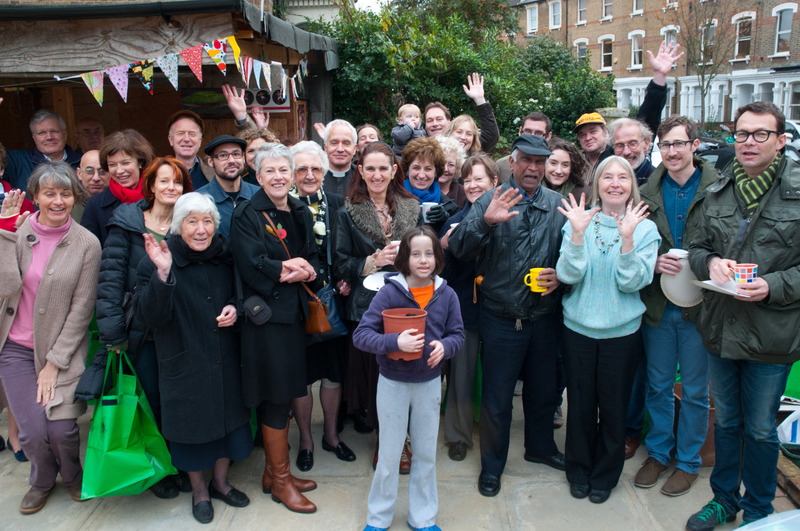 As autumn approaches, we’ve just heard that Islington Community chest will help with funding our project for next year. 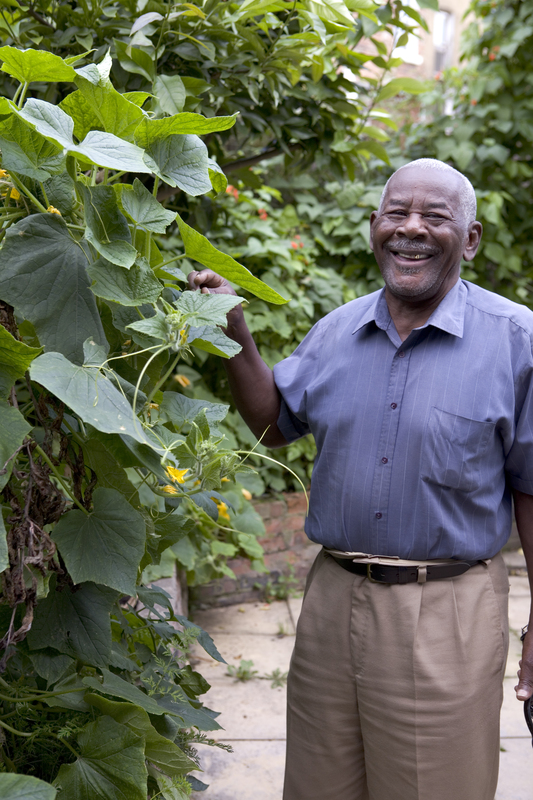 Fantastic news which means we can involve more neighbours in our veg growing scheme over the next 12 months. Another warm spring (in places!) 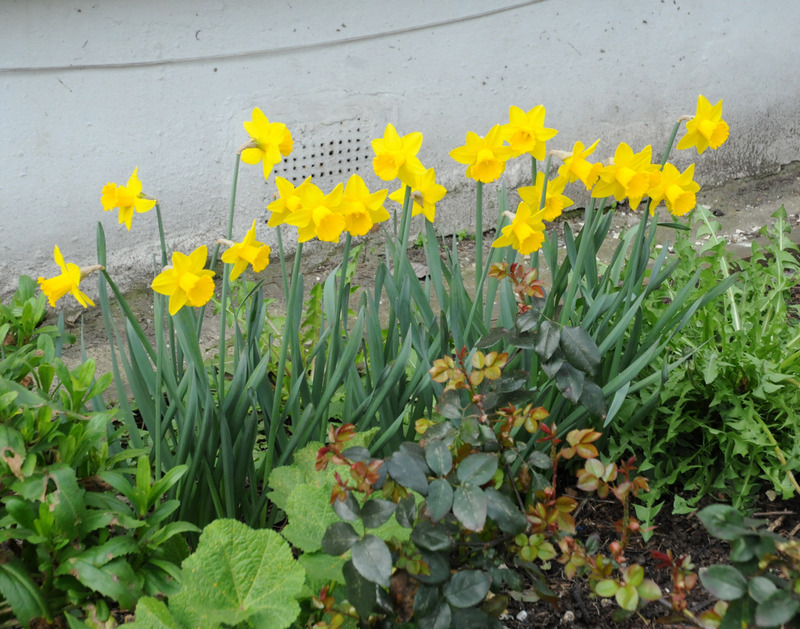 and Daffodils given away last October are in full bloom in the neighbourhood. 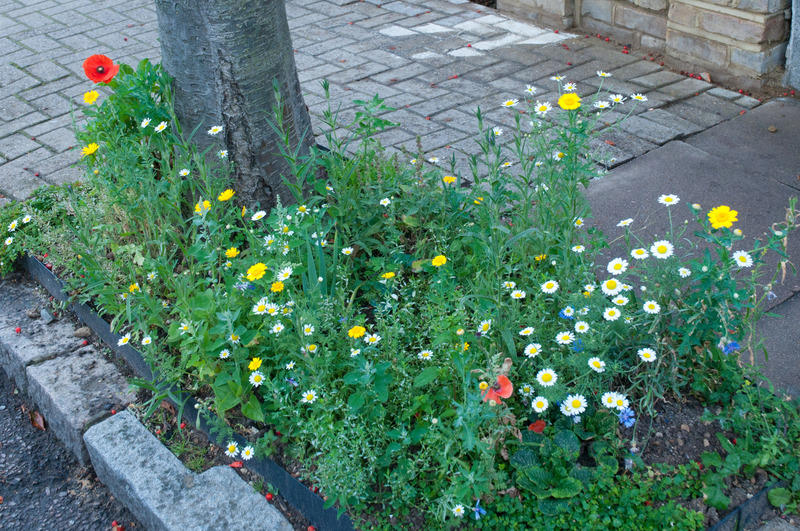 Flowers in front gardens and tree pits really brighten up our streets. 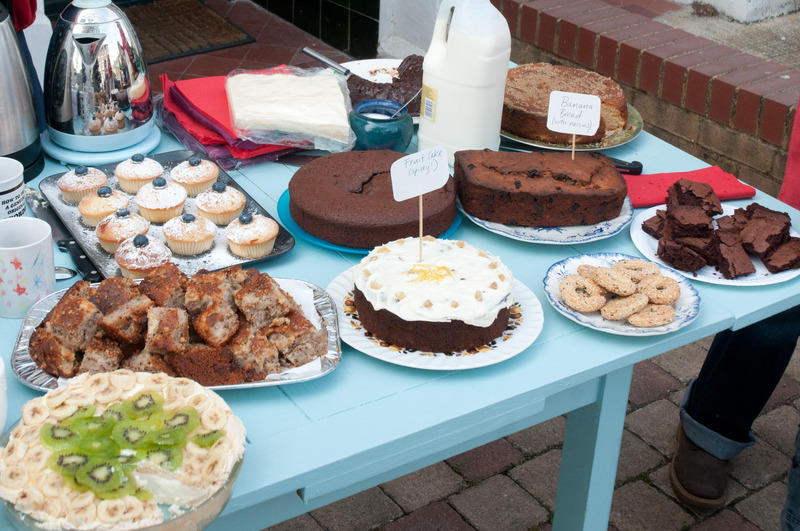 Cake Sundays have now become an institution and gorgeous weather, delicious cake and a fine array of seeds and plants to give away made our latest ‘Cake Sunday’ another really enjoyable get-together for neighbours. 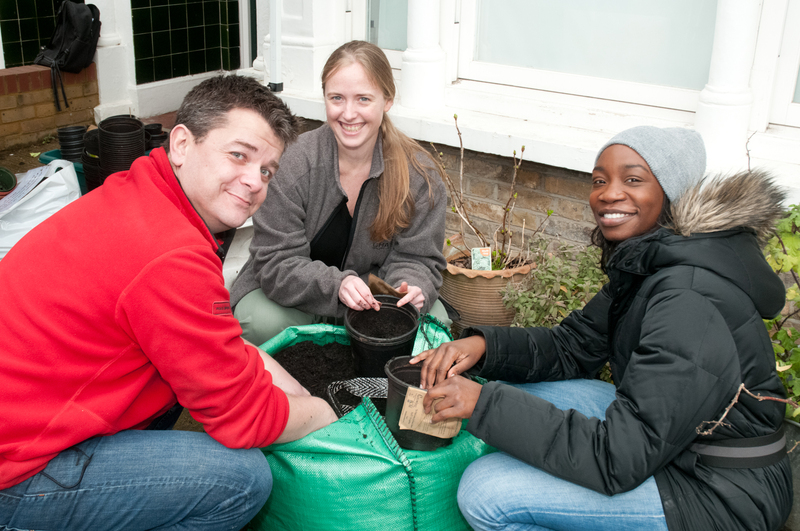 Over 100 households have now joined up to grow flowers and veg in their front gardens (and tree pits on the streets) and it was great to see lots of familiar faces as well as some new ones too. 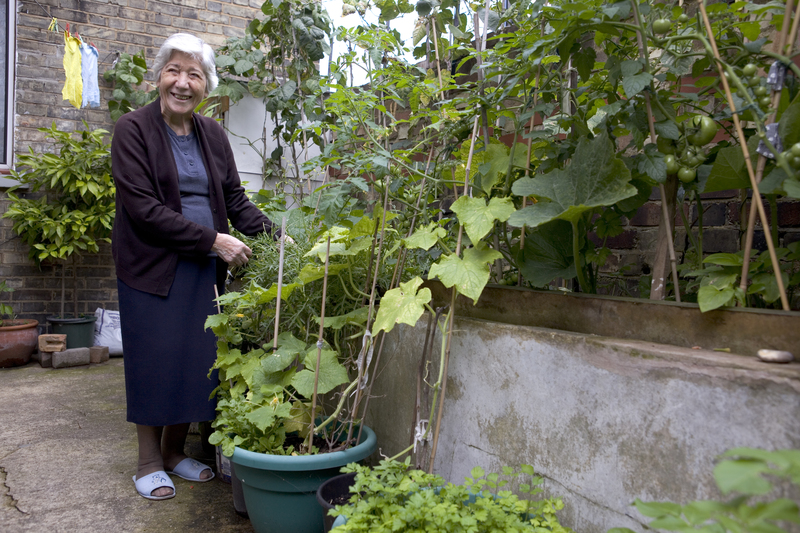 Front gardens are a great place to meet up with neighbours on ‘Cake Sundays’, chat about all things horticultural and indeed anything else! 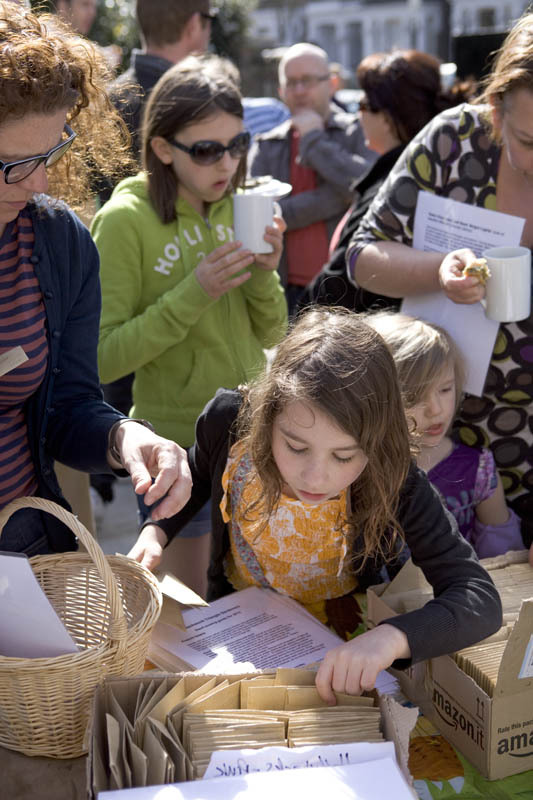 As part of the Chelsea Fringe this year, we inviting visitors to join us on Sunday May 27th 2012 in Finsbury Park, North London for another bumper Cake Sunday, with all the trimmings. Amongst many metres of bunting, visitors can come sup tea and cake, and find out more about our community veg growing project. 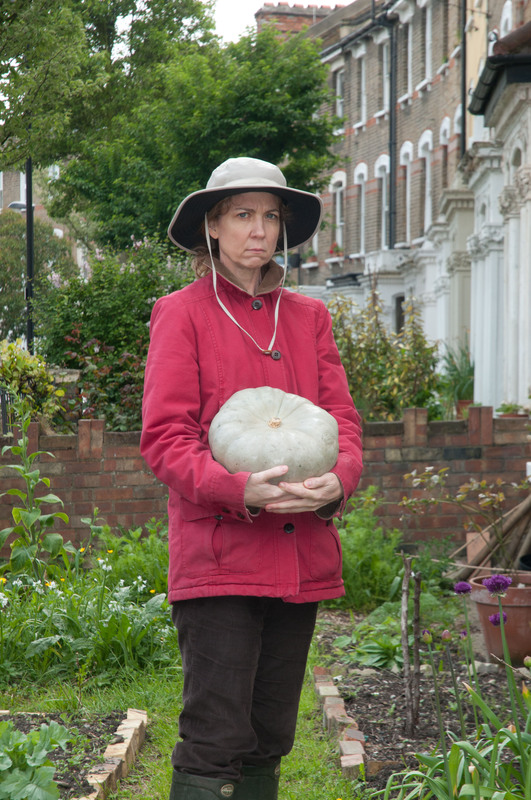 At 3.40 as part of our Cake Sunday, there’ll also be a 10 minute play called ‘Pumpkin Patch’ written by US Playwright, Patrick Gabridge, presented in a front garden (of course) by Liminal Space Productions and directed by Prav MJ. Actress Wendy Peace above, rehearsing her role in ‘Pumpkin Patch’. Not quite guerilla planting (we did knock on the door first). Last autumn we planted 300 tulips in this front garden, hoping to inject some colour into this temptingly empty forgotten corner. 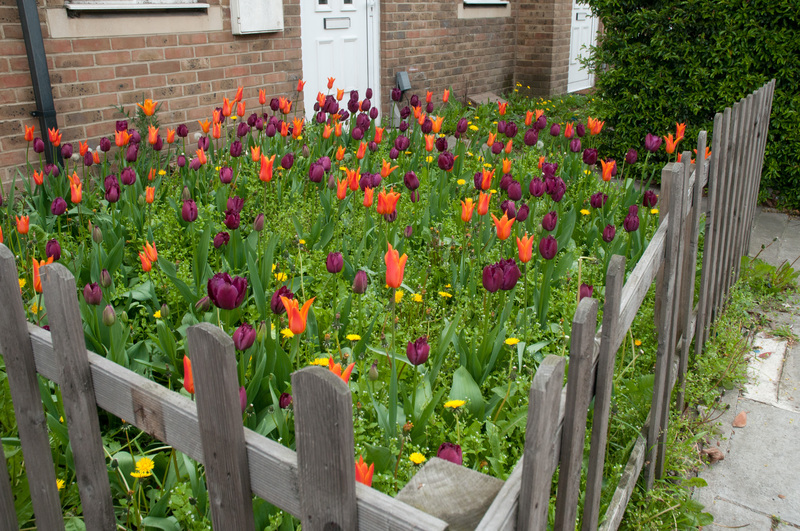 Resident is delighted with the results and the tulips brighten the day of passers-by on this busy main road too. 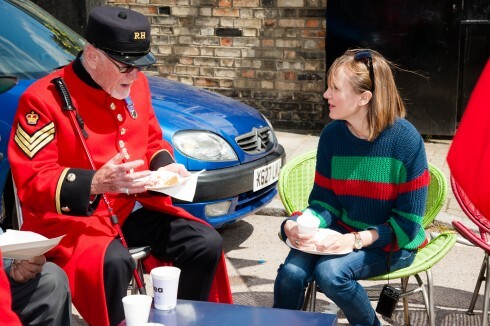 As rain and cooler weather are predicted for the coming Jubilee weekend, I was reflecting on how lucky we were with exceptional weather for our Chelsea Fringe on Sunday. 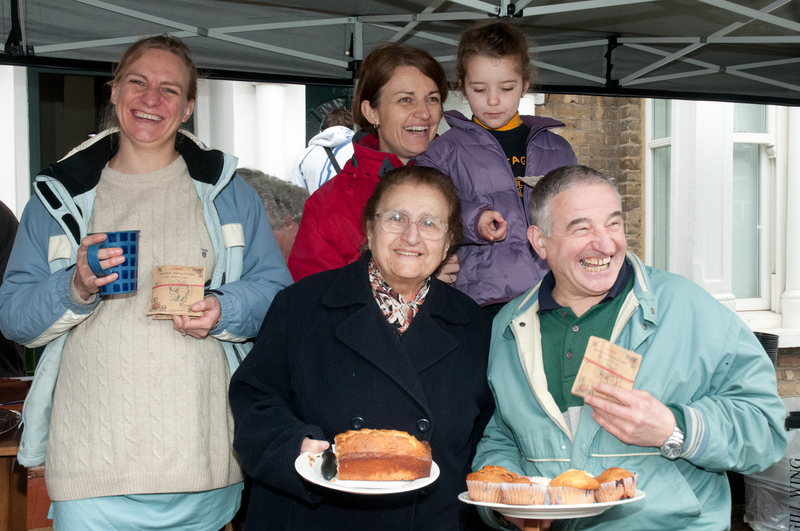 Neighbours in our community veg growing scheme have been getting together at ‘Cake Sundays’ a couple of times a year since 2009, for a seed give-away and to catch up with each other over tea and home-made cakes. 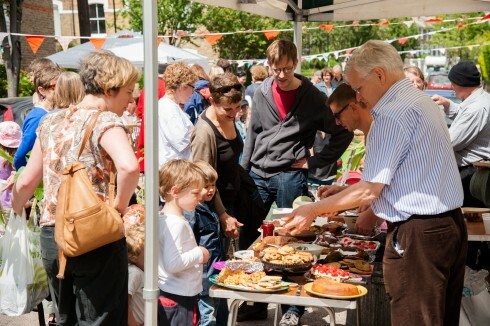 This May, as part of the Chelsea Fringe, we invited others to join us and put on a bumper spread with oodles cakes and bunting. It was a really enjoyable afternoon. 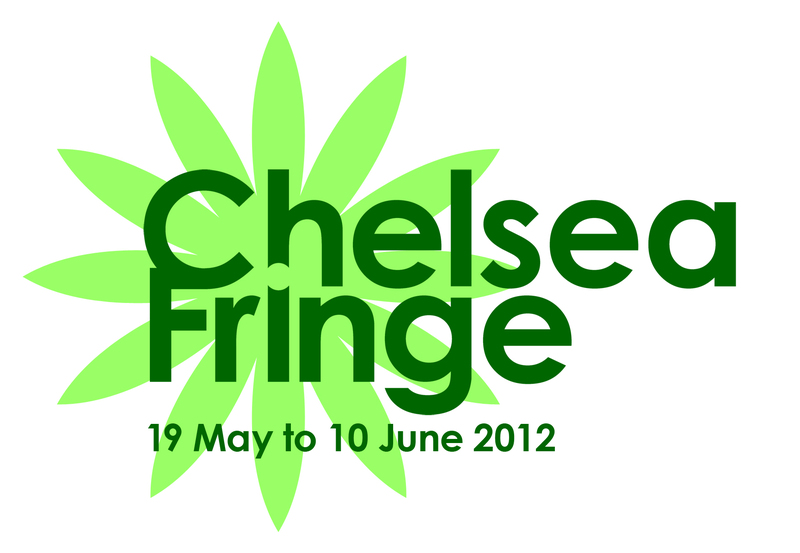 The Chelsea Fringe continues over the next 2 weekends, up until June 10th with tons of interesting horticultural happenings all over London. 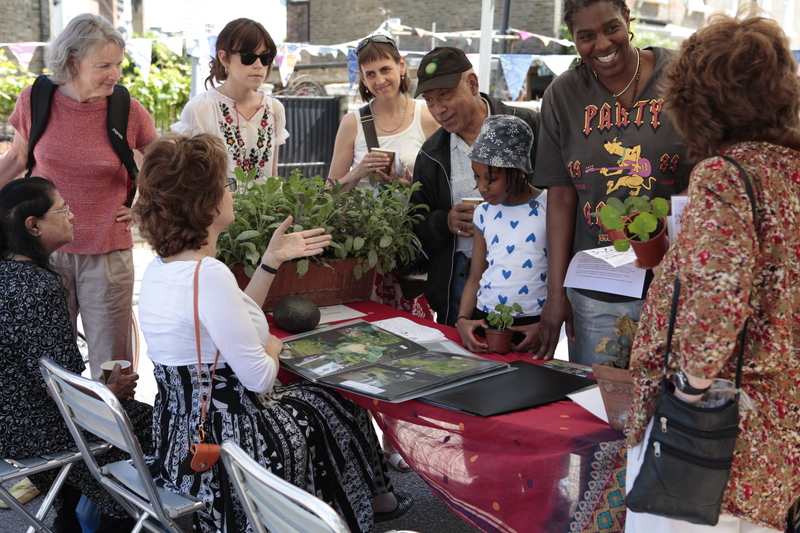 I rather fancy the Living medicine cookery workshop in Ladbroke Grove tomorrow afternoon (booking essential) and popping by for more tea and cake at a cheeky land grab in Greenwich on June 10th. Tim Richardson highly recommends, amongst others, the mintyGarden of Disorientation in Smithfields, open daily until June 9th (but closed 3rd and 4th June) and the Floating Forest installation, again in Ladbroke Grove. There are up to 90 events listed, so take your pic to get your horticultural fix over the next 10 days. You won’t be disappointed! 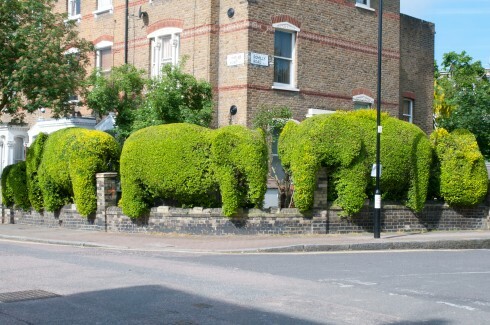 Tim and his stunning herd of topiary elephants deservedly get recognition in the Telegraph . Full steam ahead for 2013! My book, based around our project is now published. 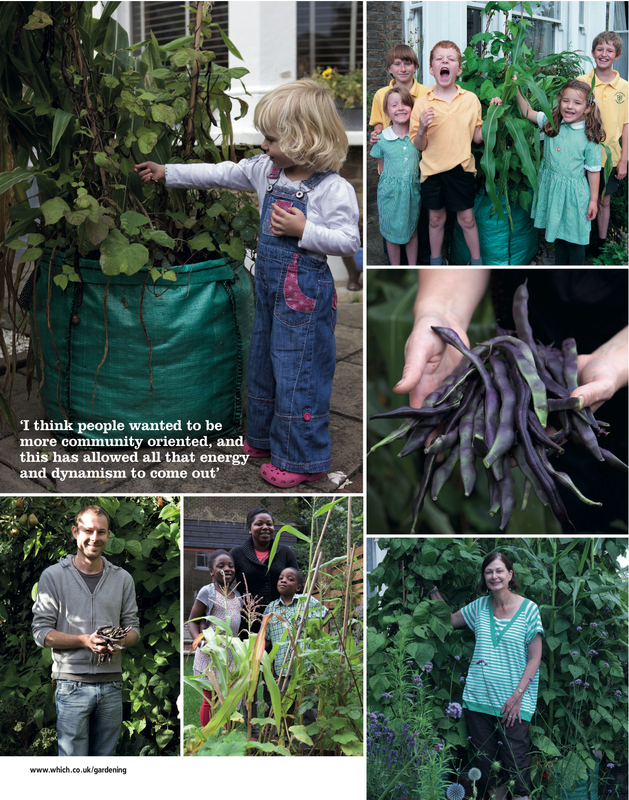 It celebrates the fact that anyone can ‘grow your own’ and that through veg growing you can meet your neighbours and grow your own community too. I love the fact that it’s packed full of pics of my fantastic neighbours, as well as being a month by month guide to growing veg. Meanwhile, we’ve been gearing up for the year ahead by installing tree pit edging around the streets in our neighbourhood. And this will allow us to plant up a wider variety of perennial plants and wildflower seeds to brighten up our streets later in the year. 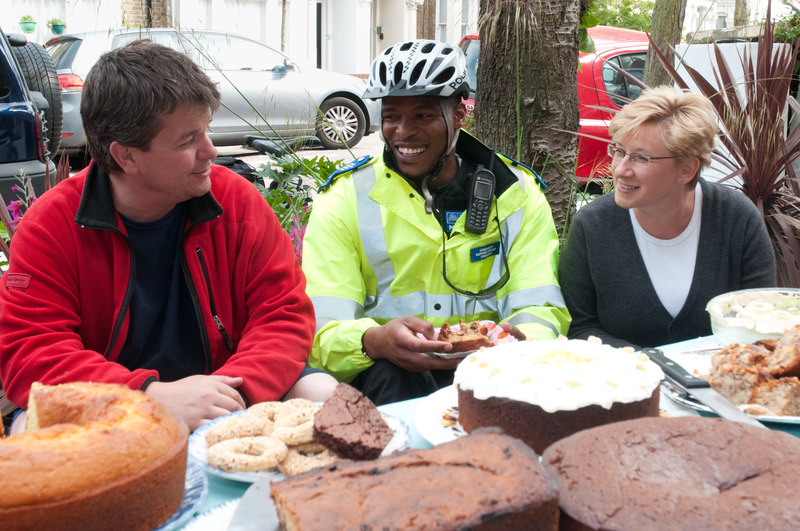 Our next get-together is the Chelsea Fringe Cake Sunday on Sunday 2nd June 2013 from 2-4pm in Finsbury Park. All are welcome to come and visit our project at 39 Ambler Road, London N4 2QS. There’ll be oodles of tea and home-made cakes plus a number of small happenings and installations in the vicinity. 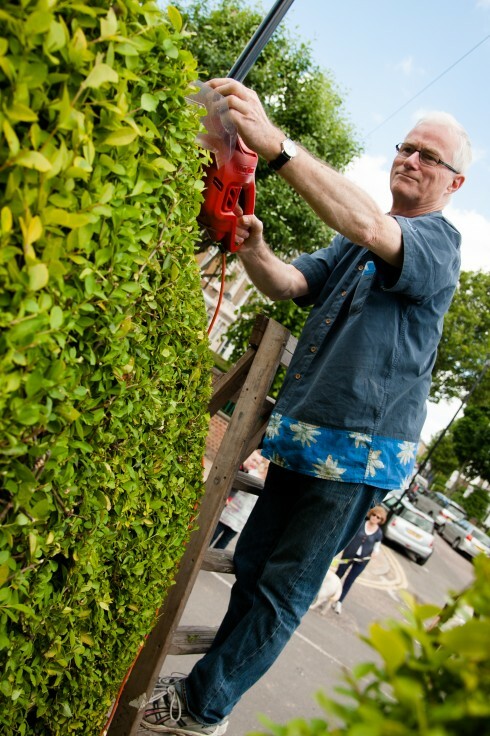 Marvel at our topiary herd of elephants and see Tim Bushe give a topiary demonstration. 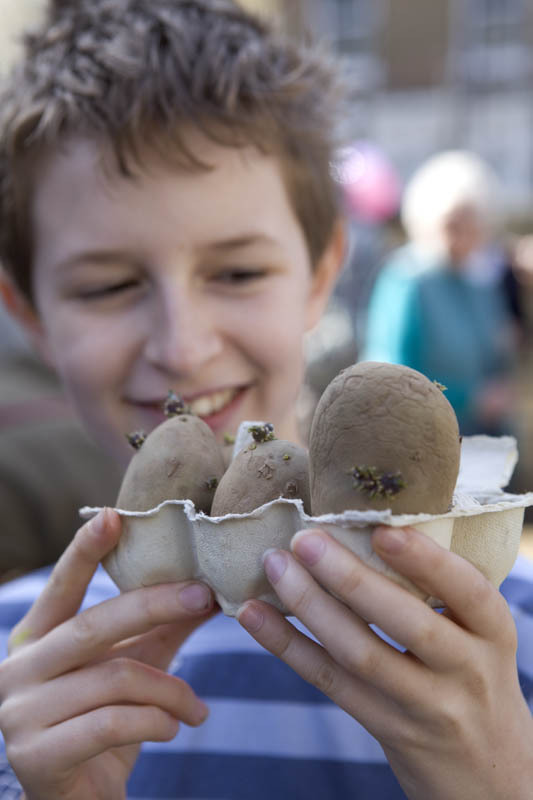 Join in with seed bomb making, be dazzled by our disco ball hanging baskets and enjoy free vegetable seeds, a strawberry pillar box, and a botanical art exhibition in our local green grocers. 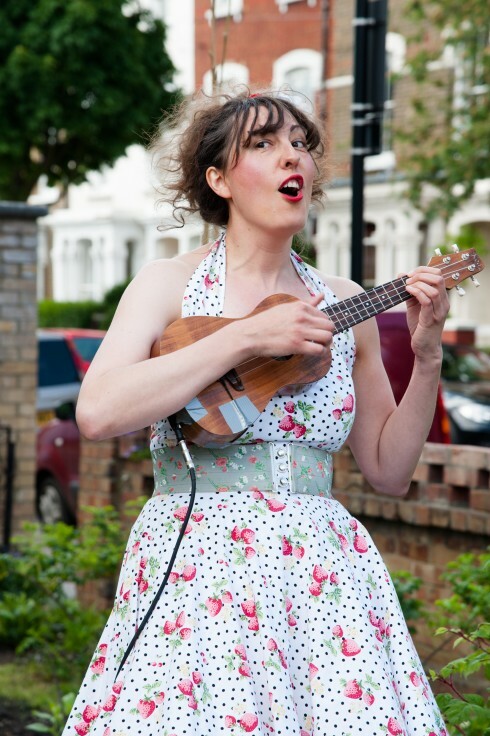 We finish off at 3.45pm with ‘Can you Dig It’, above, singing charming horticulturally themed songs in one of our front gardens. Delighted that they can join us! 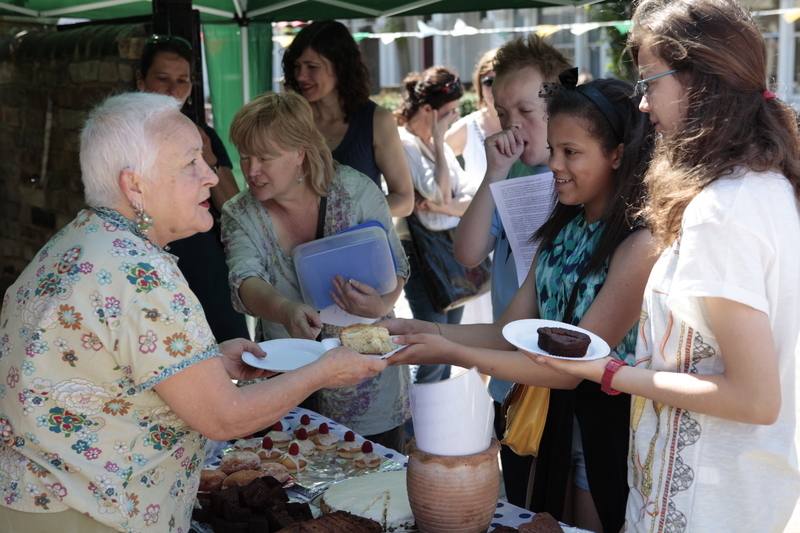 Following our Cake Sunday, five minutes away by the Arsenal tube, there’ll be free foraging walks with Forage London at the Islington Ecology Centre, one at 4.30pm and another at 5.45pm. 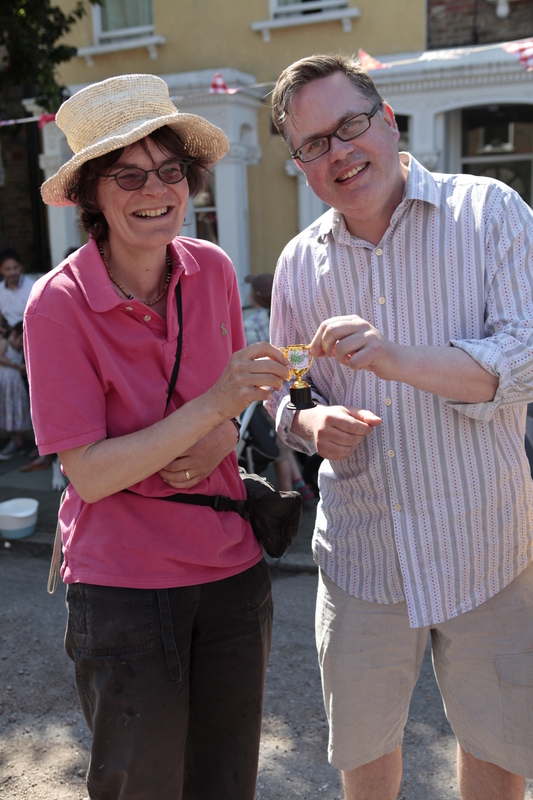 There are 15 places on each walk and you can book a free place now on 020 7527 4374. I think they’ll be fab! 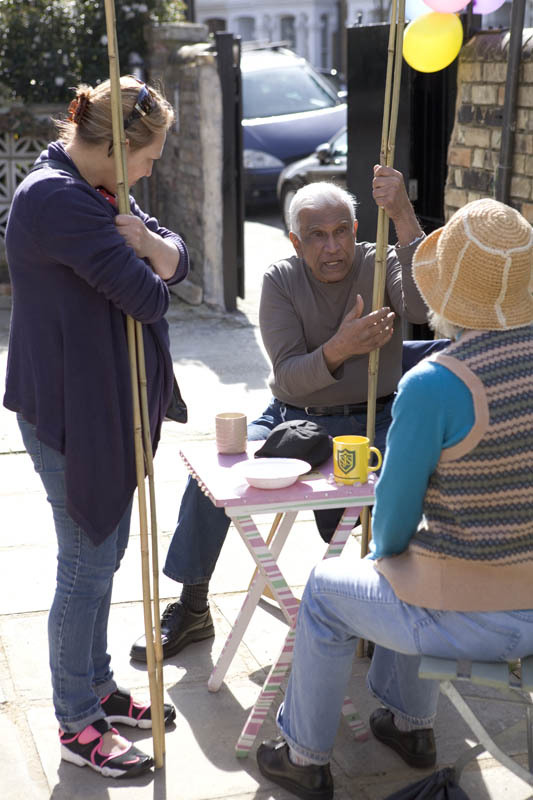 and the warm and balmy weather and chilled atmosphere allowed neighbours and members of the public to chat and relax in our closed-off street. 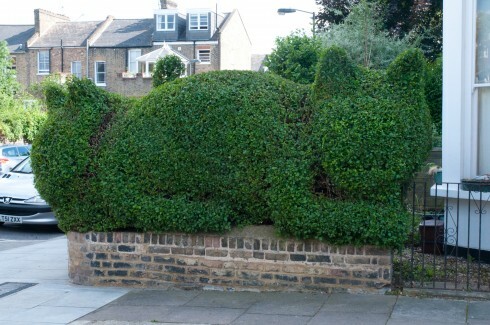 as was the keenly anticipated topiary demonstration by Tim Bushe. Our topiary herd of Elephants is really coming together after 18 months of trimming and delighting all who pass by in the street. They’ve also featured in Christine Walkden’s piece on topiary for ‘The One Show’ (BBC1 Summer 2013) and Rachel de Thame’s episode on topiary for ‘The Great British Garden Revival’ (BBC2 Dec 2013). and the afternoon was perfectly rounded off with Jo from ‘Can you dig it’, entertaining us with songs of vegetables and allotment rivalries. 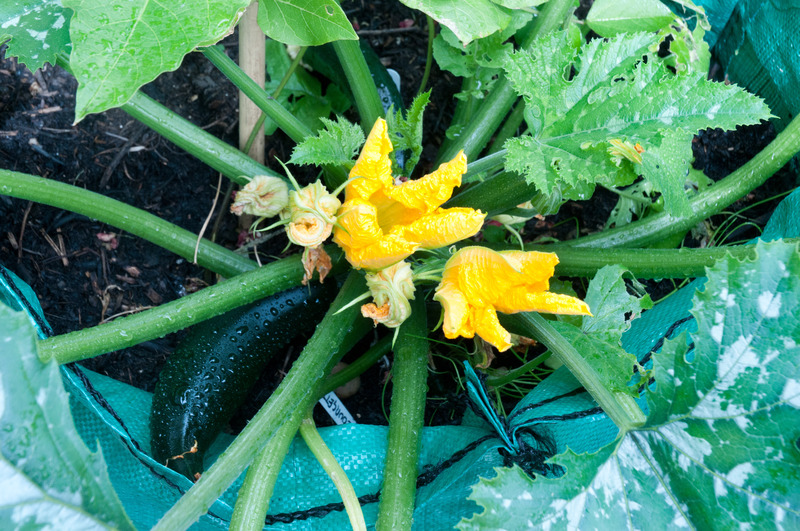 Since June, the fantastically warm warm summer has helped neighbours grow some fabulous vegetables this year. 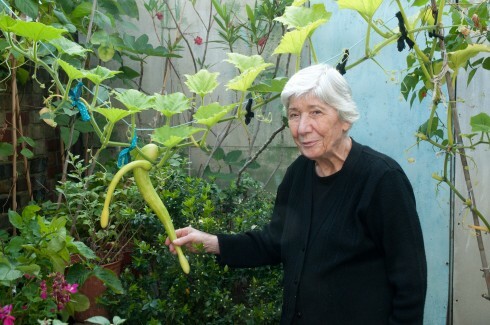 I love Eleni’s Tromboncino courgettes, romping across her garden. 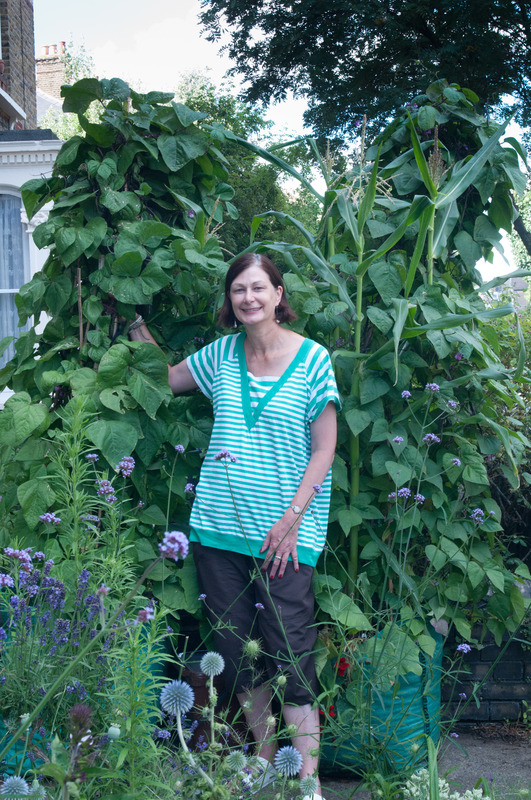 Runner beans have always been a successful crop in our growbags, and Charlotte has had many dinners from just a few seeds. 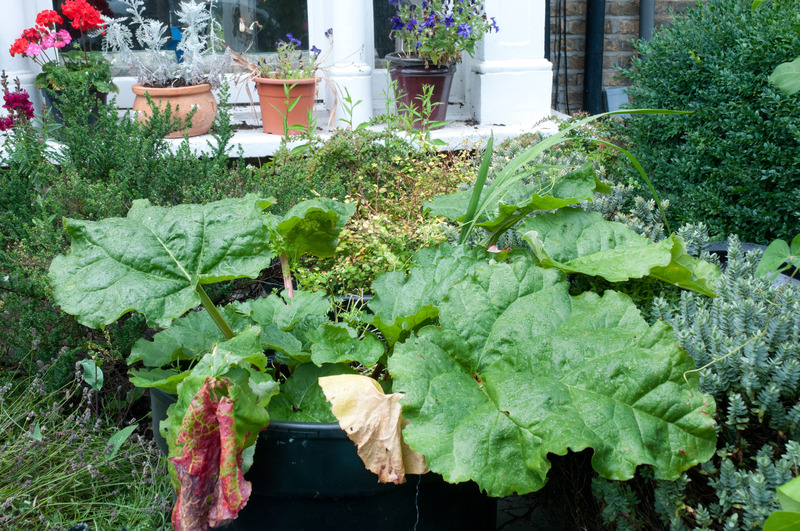 If you have room for just one vegetable, this must be one of the most productive for a small space. 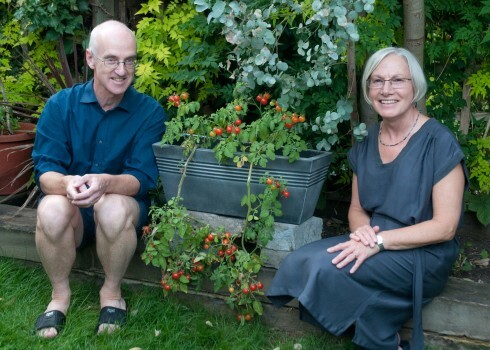 Jill and Ben have had a great crop from these Terenzo hanging tomatoes. Wilkinsons gave us a discount on these planters as we were on the hunt for larger than average window boxes and these fitted the bill. 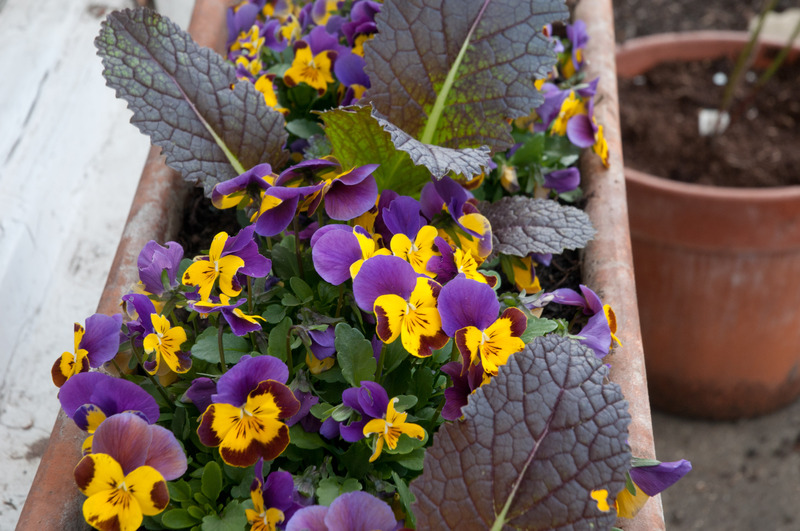 They’re deeper and higher than your average terracotta window box, which means there’s more room for roots to grow and they require less watering. 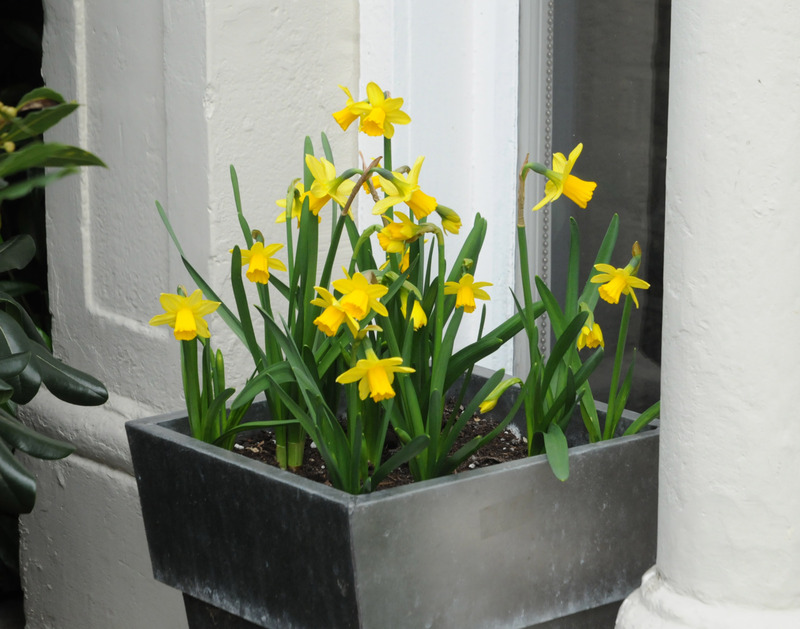 They’re really lightweight too, so easy to cart up stairs for those high up window ledges. A good find for veg growing in small spaces. 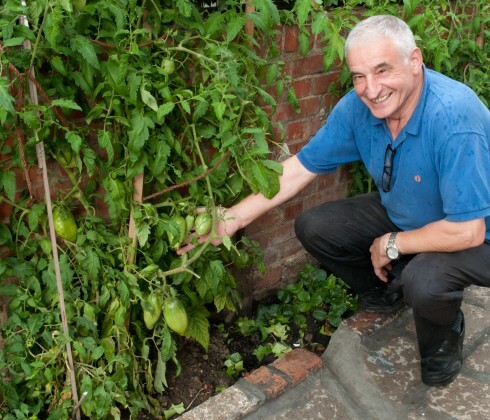 Manuel’s tomatoes are coming on well and should hopefully ripen before the end of summer. They’re a gorgeous pointy plum shape with irregular dimples. Looking forward to seeing if they taste half as good as they look! and her front garden is always a joyous spot to pass by. 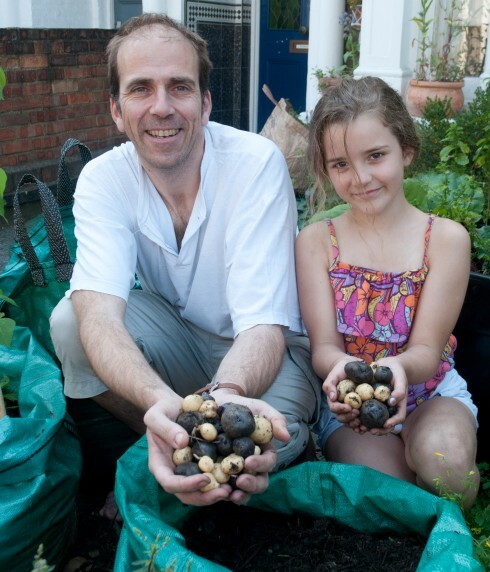 And Seb and his daughter had great fun digging up this year’s potatoes. 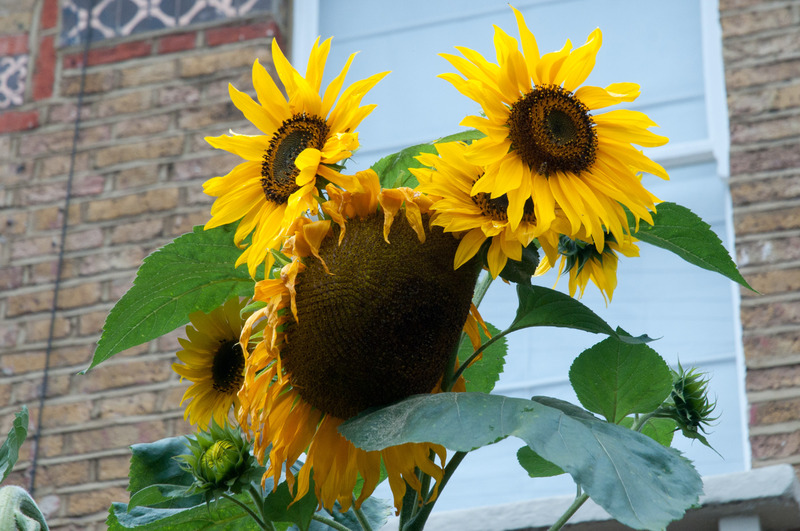 We also gave away sunflower plants (seeds supplied by Wilkinson’s-many thanks) at our Chelsea Fringe Cake Sunday, and these really did brighten up the whole neighbourhood. It’s amazing the effect a few packets of seeds (and a little effort!!) can make! A completely innovative approach – what a fab fab idea. We too are a community veg garden (in Surrey) so have an inkling about how much work you have done, though ours structured in a completely different way. Inspirational! Can you make it self-funding do you think? Would be great to think that you would keep on, year after year, regardless of whether anyone else ‘gets it’ enough to fund you! Come see us in Surrey sometime and we’ll invite ourselves to come see you too if we may. What a lovely project. I guess there are many people doing this kind of project, but what really stands out about your scheme is the number of people you seem to have got involved. You must have a great talent for bringing people together and making things happen. -Lovely to see. It’s so good to see the effect this has had on the community. Have you thought about giving talks to raise funds? I’d be happy to book you for my local garden society in Kent. Absolutely Fantastic. I wish more communities would do what you are doing,its great. I have just stubbled across your blog and love what you are doing! I am a student looking to do my undergraduate thesis on community gardening/growing in the city and the transformation of the front garden, what you do is just that! and so inspiring! Would you be willing to answer some questions about your project? hopefully I will hear back from you – love what you have created for your community! 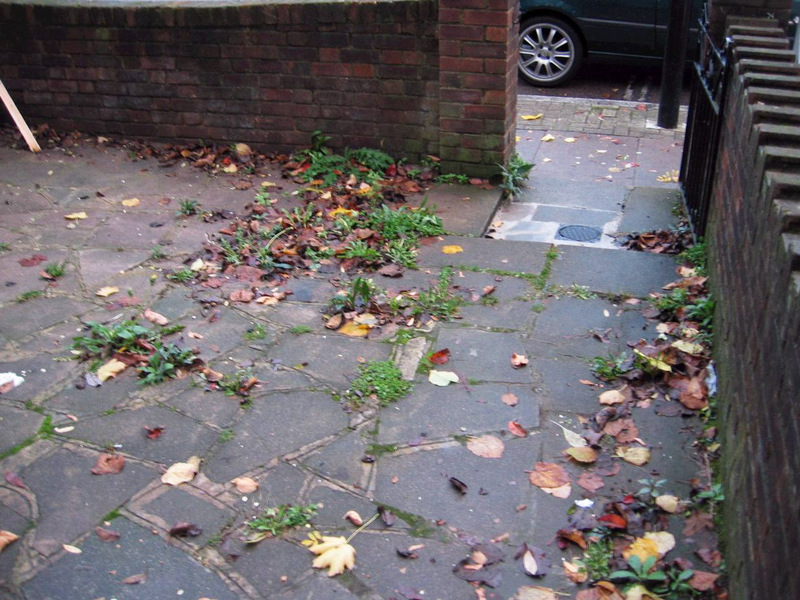 We have just bought a house in St John’s Wood that has a large concrete front garden – I am looking to turn it into a ‘growing’ garden and would love any advice that you might have for me. Hi Ruchika, If money was no object, then I’d definitely have the concrete removed and start my plans from there. If the concrete is to stay, then I’d build some raised beds on top or import some large pots, allowing plenty of growing space for the plants that you’d love to grow. I think thus is absolutely amazing, fun and am blown away by the deep sense of community. Fantastic work guys! 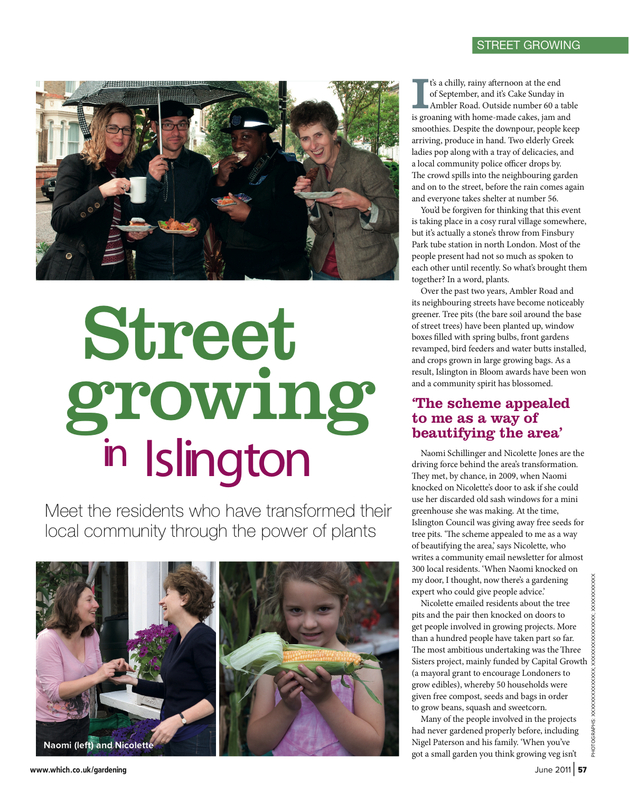 So happy this is happening in my area (im just the other side of finsbury park to you) love the fact you are bringing the community together through a shared love of growing plants! Good luck with this years project and hopefully pop down to see you next weekend. Id love to try some seeds please if thats ok- how would I go about this? 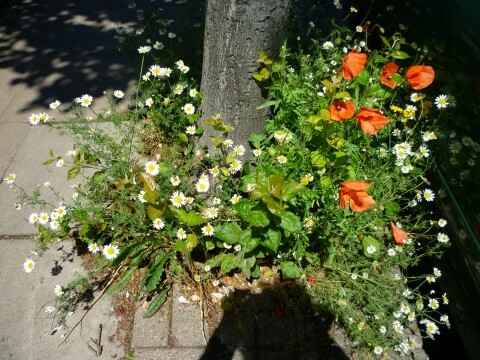 I thought that I recognised this item – which I wrote for De Beauvoir Gardeners’ 2012 Chelsea Fringe project on making our streetpits bloom. So it’s really a Hackney project, rather than Islington (although DBG has some Islington members). I gather that you’re coming to talk to DBG tomorrow, which should be really helpful. 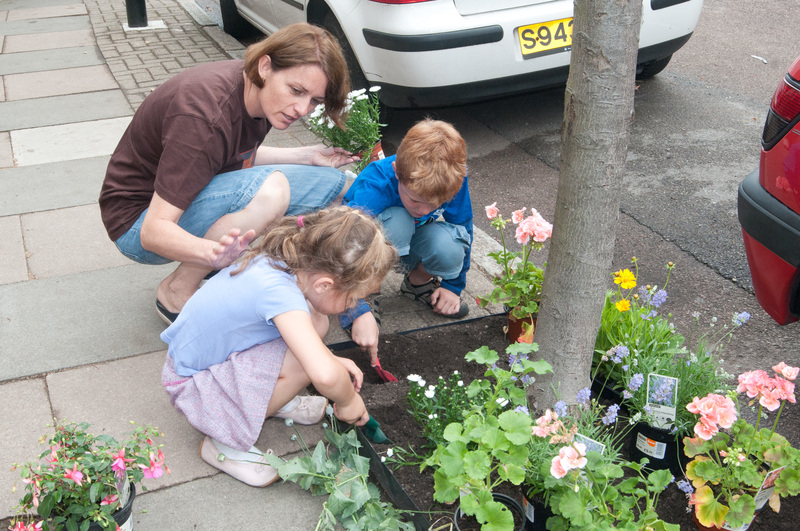 You’ve managed to do a huge amount more community-building, based on street gardening in your area, than we’ve done so far – and it would be wonderful to emulate this across London. 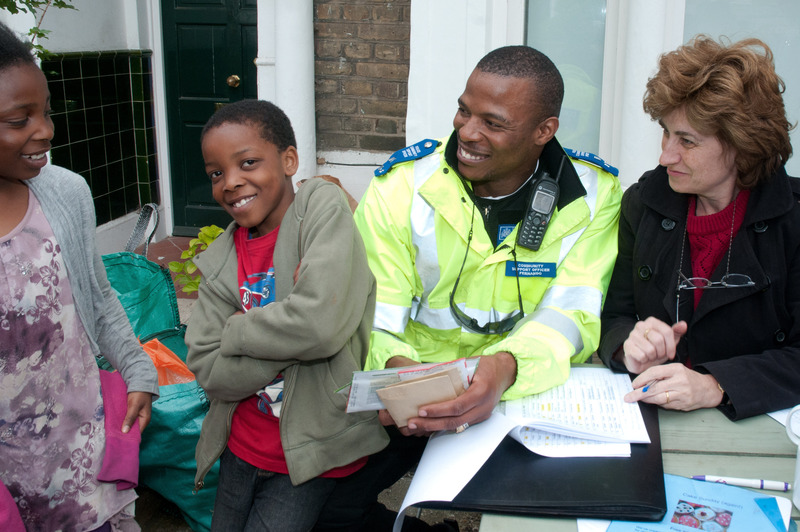 Islington seem to be much more generous with their funding than Hackney – so far at least. If we’d had access to growbags full of compost and free seeds, i think that we’d have got further along the path you’ve blazed. Your post is an inspiration! Naomi is being modest, Chris. She is not only a professional gardener but also a professional photographer. Just a “Hello” from Belgium… This is just GORGEOUS, and makes you want to start something similar wherever you may live. I was looking up sage pictures on Yahoo and came upon your site. What a wonderful idea! I live in the Unites States of America in the state of Virginia on the east coast. I wish I could move to your town! Have fun everyone! Hi Mark, you’d be more than welcome! What’s the street growing like in your town in Virginia?